The opening photo for John Anderson’s lecture on Saturday at Winterthur was quite arresting, and the remaining slides were equally as beautiful. 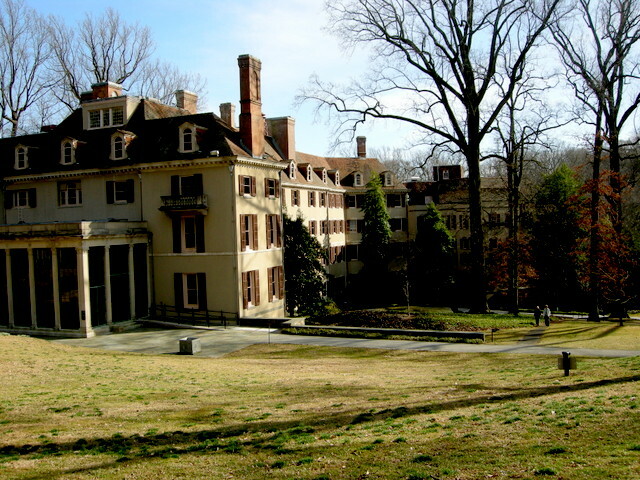 On Saturday, Michael and I attended the annual Bank to Bend lecture at Winterthur Gardens in Delaware, U.S. The event honors Henry Francis du Pont’s walk from bank to bend to celebrate the gorgeous bulb display on the March Bank. That walk was beautiful on Saturday as you will see below. The lecture was delivered by John Anderson, the Keeper of the Queen’s Gardens of Windsor Great Park, a very big job as the gardens host 6 million visitors a year. His lecture showed us some arresting views of the Savill and Valley Gardens, totaling over 900 acres, and how they have changed over time as well as his reasoning behind those decisions. The Queen is Anderson’s boss and there has been a garden here for a thousand years, so any changes must be well thought out. Anderson is also in charge of the gardens at Frogmore House, which is HM the Queen’s private residence and garden at Windsor. After the lecture, we had a delicious lunch and walked around Winterthur for three hours. It was heavenly. 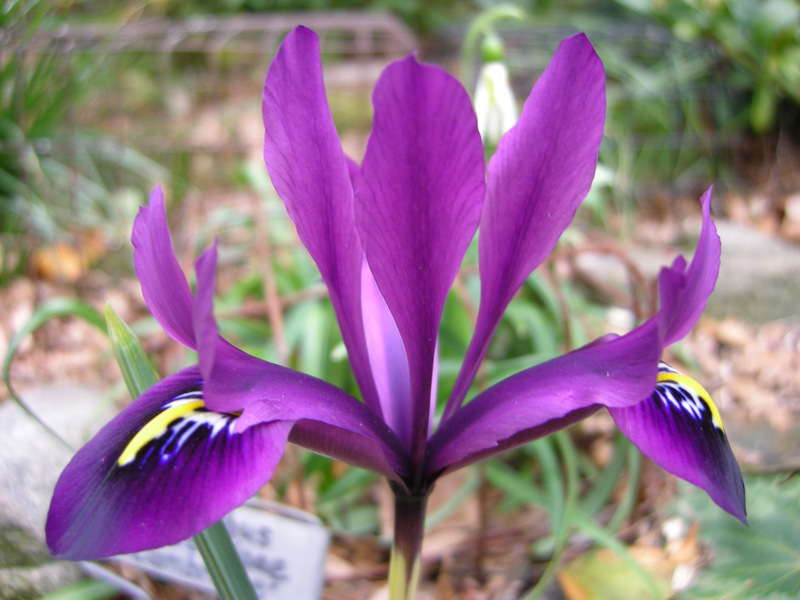 Nursery News: The 2019 Winter Interest Catalogue is posted on the website here, and we are taking orders for local pick up. 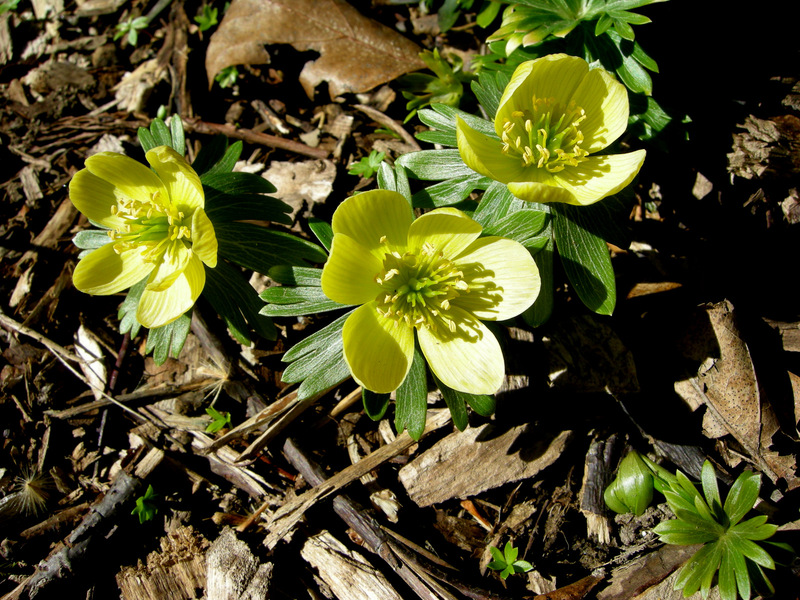 If you are on the customer email list, look for the 2019 Hellebore Offer in the next week. The 2019 Snowdrop Catalogue is sold out. If you wish to get notification of the 2020 catalogue, send your full name, location, and cell number (for back up use only) to carolyn@carolynsshadegardens.com. The Savill Garden hosts an outstanding magnolia collection. The rose garden at Savill has recently been renovated to make it more attractive to visitors and visually interesting. Frogmore House and Gardens, HM the Queen’s private residence and garden at Windsor. Frogmore was also the location of Prince Harry and Meghan Markle’s wedding reception. Anderson described the incredibly tight security arrangements this entailed. Our intrepid group left to right: Carol Long, Curator of the Winterthur Garden; Charles Cresson, local horticultural authority and educator; John Anderson, Keeper of the Queen’s Gardens at Windsor Great Park; Linda Eirhart, Director of Horticulture at Winterthur; and Michael Drennan, co-owner of Carolyn’s Shade Gardens. They are posed in front of Winterthur’s dawn redwood, Metasequoia glytostroboides, part of the original collection of these trees in the 1940s. The dawn redwood was a sight to behold against the beautiful blue sky on Saturday. We spent most a lot of our three-hour walk admiring Winterthur’s incredible trees, many of which are champions. John wanted his photo taken with this massive Sargent’s cherry, Prunus sargentii. He also wanted to record his visit to the champion tulip tree or tulip poplar, Liriodendron tulipifera, by the Winterthur mansion. 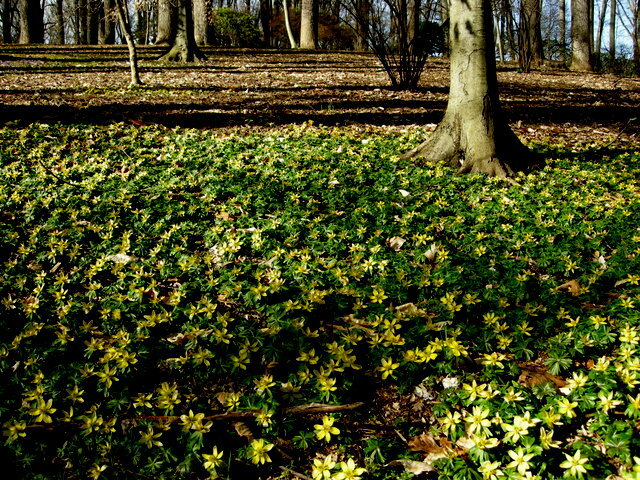 The Winterthur March Bank was glorious, covered with winter aconite, snowdrops, adonis, and leucojum. 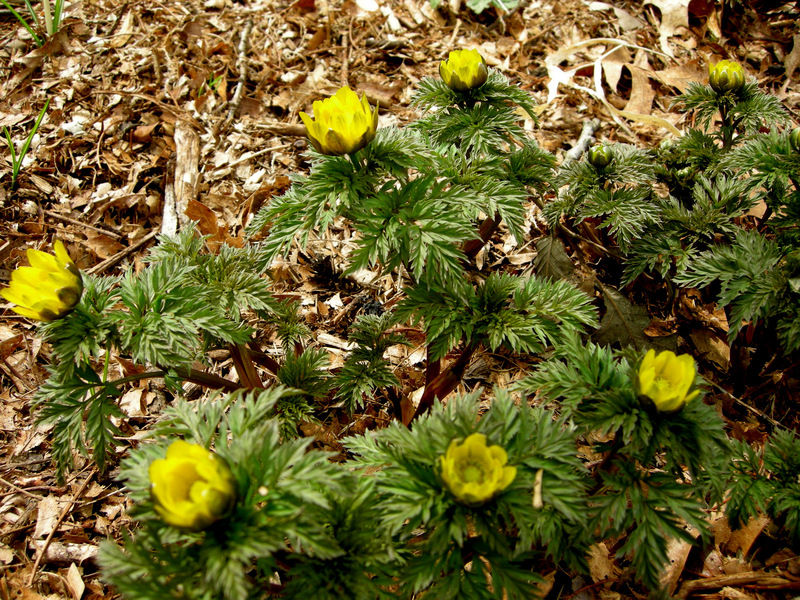 Nothing like a blue sky to show off winter aconite, Eranthis hyemalis, to perfection. The Amur adonis, A. amurensis, was also peaking. There were massive drifts of the giant snowdrop, Galanthus elwesii. I have never seen G. elwesii growing as well as it does at Winterthur. And then you come across something even more special: this little clump of three giant snowdrops that have solid green inner segments and are at least three times the size of a normal giant snowdrops. Normal size on the right with the giants on the left and behind. A form well worth naming! 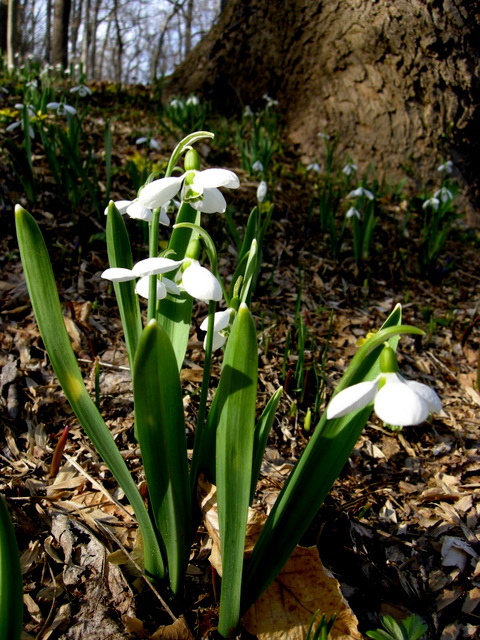 Charles Cresson spotted this three-headed spring snowflake, Leucojum vernum. I have seen twin heads but never three. Let’s hope it’s stable. This was one of the best “horticultural” days that I have ever spent. Thank you to Winterthur, John Anderson, my mentor Charles Cresson, and my wonderful husband Michael for making it happen. Summer snowflake with Celandine poppy in the woodland at Carolyn’s Shade Gardens. 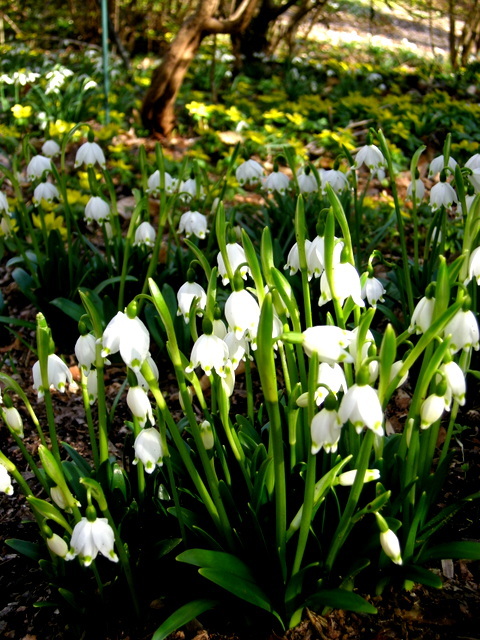 When snowdrops are finishing, their close relatives, snowflakes (Leucojum), are ready to take over the display. They are quite beautiful, but haven’t been subjected to the intense selection process that has resulted in over 1,500 snowdrop cultivars. They are very easy to grow, and I think they deserve more attention. Leucojum aestivum in my woodland in April. 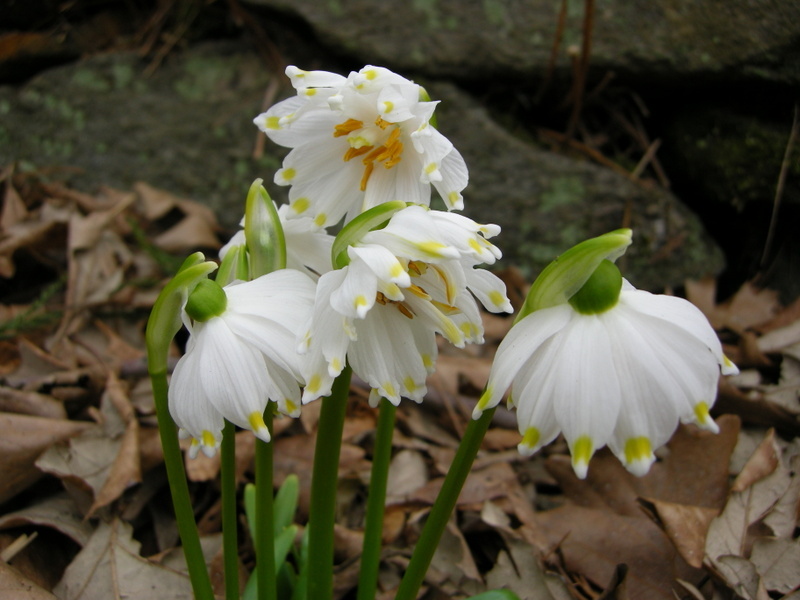 There are two main species of snowflakes: Leucojum aestivum or summer snowflake and Leucojum vernum or spring snowflake. Summer snowflake blooms in April in our area so the common name is very confusing. 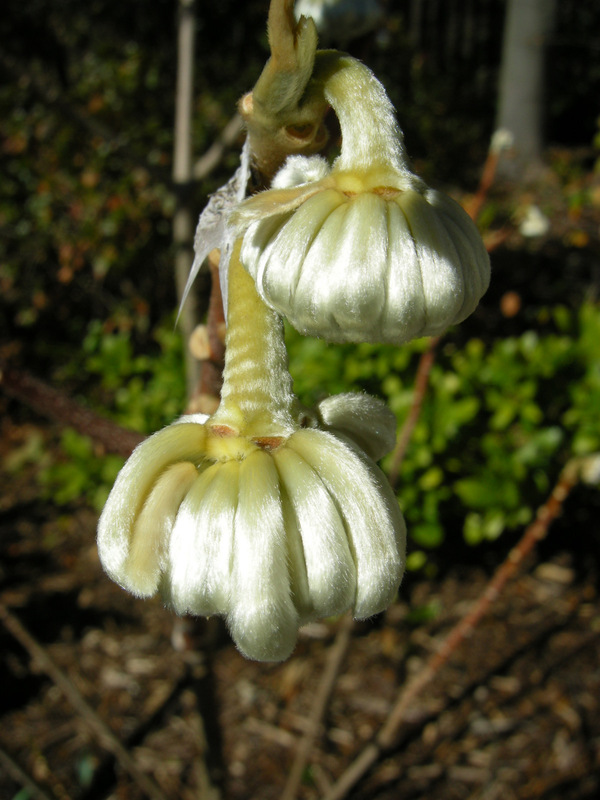 It is a large and vigorous plant reaching 12 to 18 inches with multiple green-tipped, white, lantern-shaped flowers at the end of each flower stem. It likes moist soil but grows quite well in my dry woodland as you can see from the photos. It grows in dappled woodland conditions but also quite sunny spots and seeds aggressively in my garden. Summer snowflake is native to Central and Eastern Europe. The cultivar ‘Gravetye Giant’ has bigger flowers, but I have not grown it. 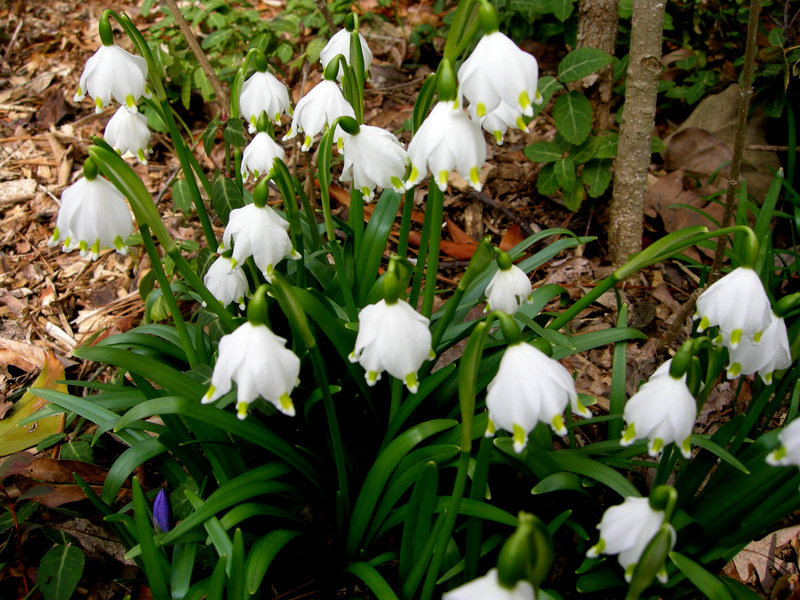 Spring snowflake, Leucojum vernum, blooms in March in our area so it could easily be called winter snowflake. On its own, it is a diminutive plant reaching 6 to 9 inches with single, green-tipped, white, lantern-shaped flowers at the end of each flower stem. The leaves are strap-shaped and a very pretty glossy, bright green. 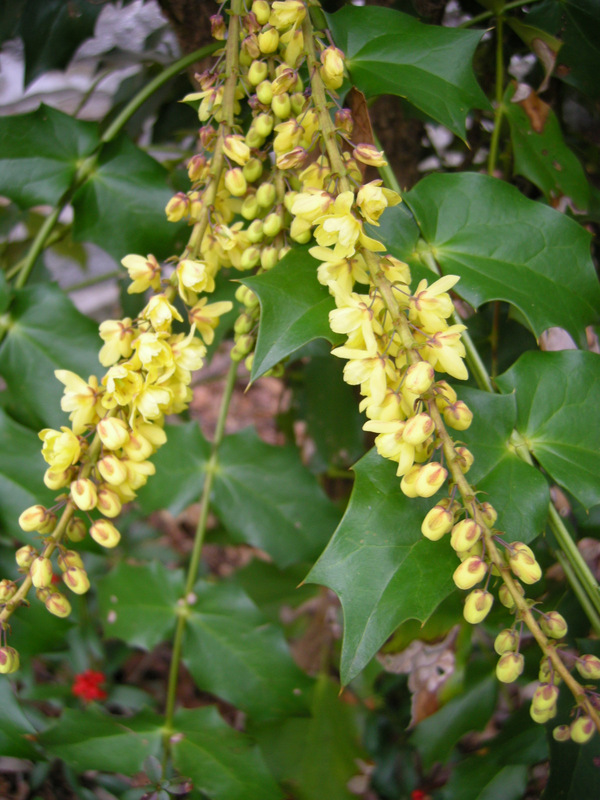 It likes moist soil but grows quite well in average moisture conditions in deciduous shade to part shade locations. 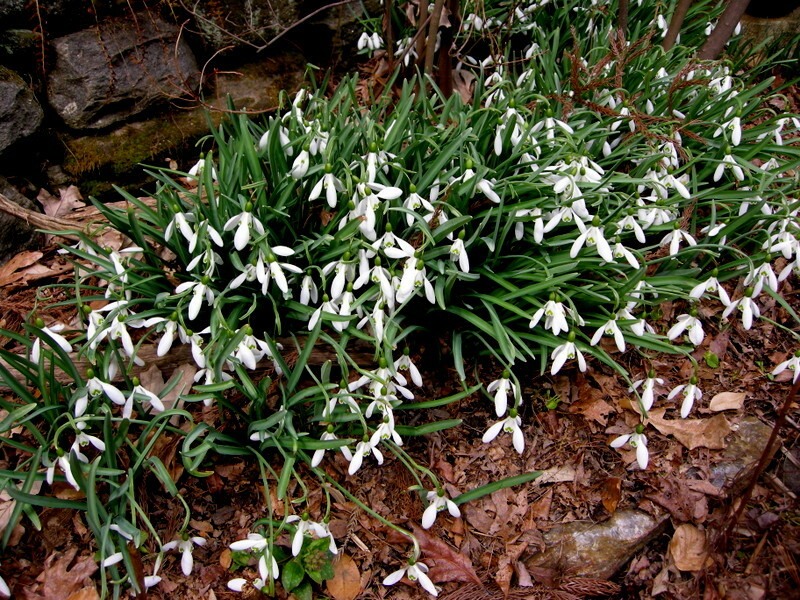 Spring snowflake is native to Central and Southern Europe. A very upright and dark green Leucojum vernum—it stood out from the hundreds around it. A clump of spring snowflake. 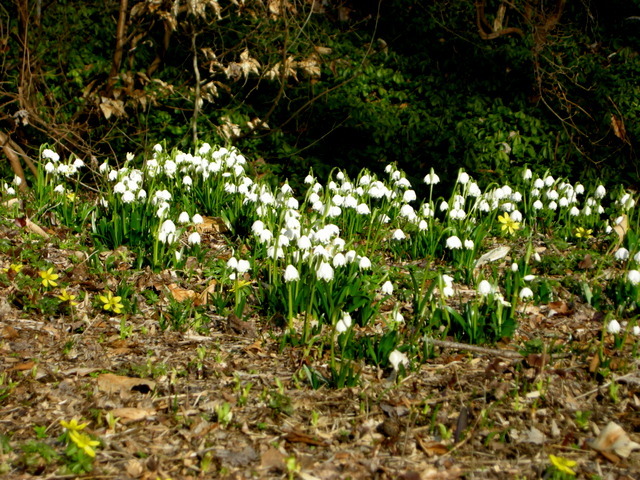 A hillside of spring snowflake in mid-March at Winterthur. Spring snowflake combined with Amur adonis and glory-of-the-snow in mid-March at Winterthur. Leucojum vernum var. 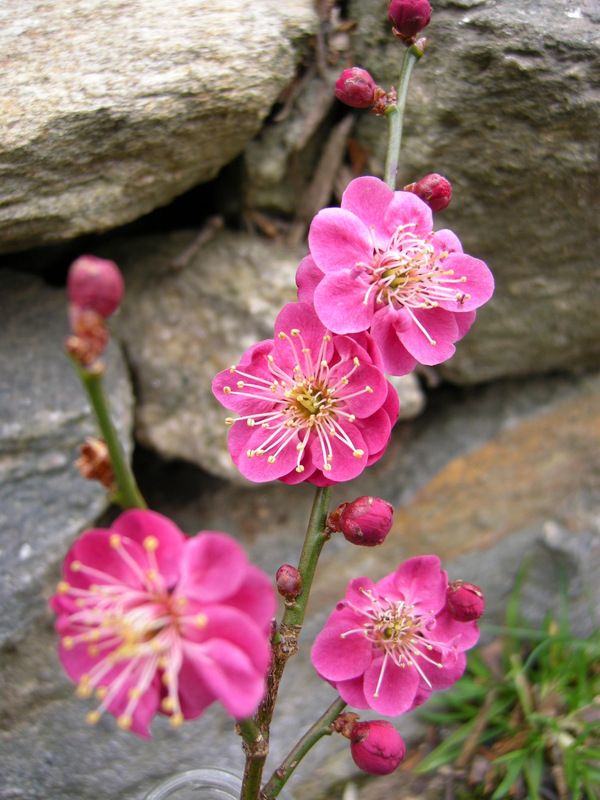 wagneri (or vagneri) produces two flowers on each stem, although none of mine did that this year. I have read that it is no longer a valid variety. 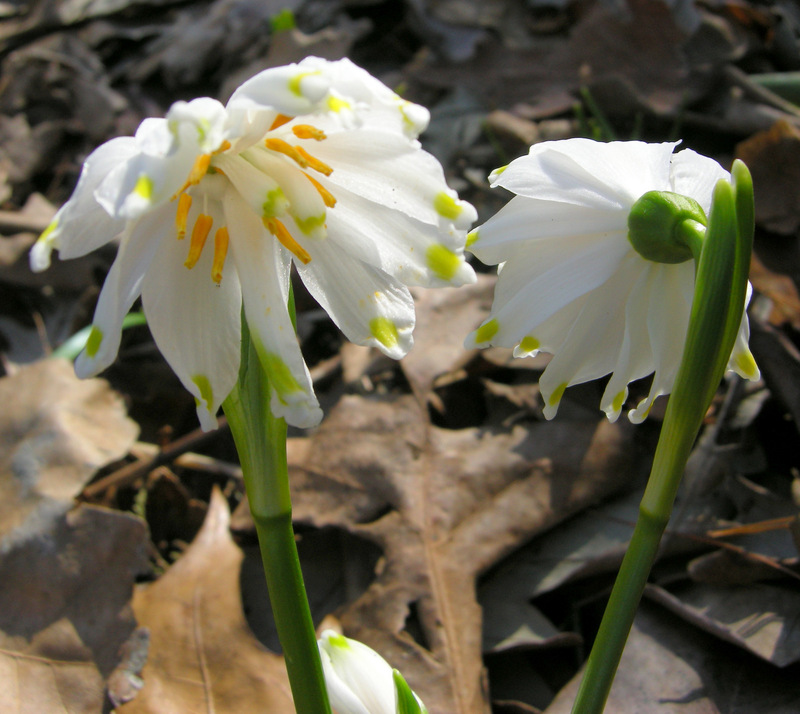 If you visit naturalized populations of Leucojum vernum, a certain percentage will have twin flowers. This photo shows a wagneri with standard-shaped flowers and green spots. This wagneri has the yellower spots typical of var. carpaticum pictured below. Leucojum vernum var. carpaticum has yellow spots on each petal instead of the normal green spots. ‘Null Punkte’ from Germany is pure white with no spots. ‘Gertrude Wister’ is a semi-double spring snowflake with 12 or more petals instead of the normal 6. 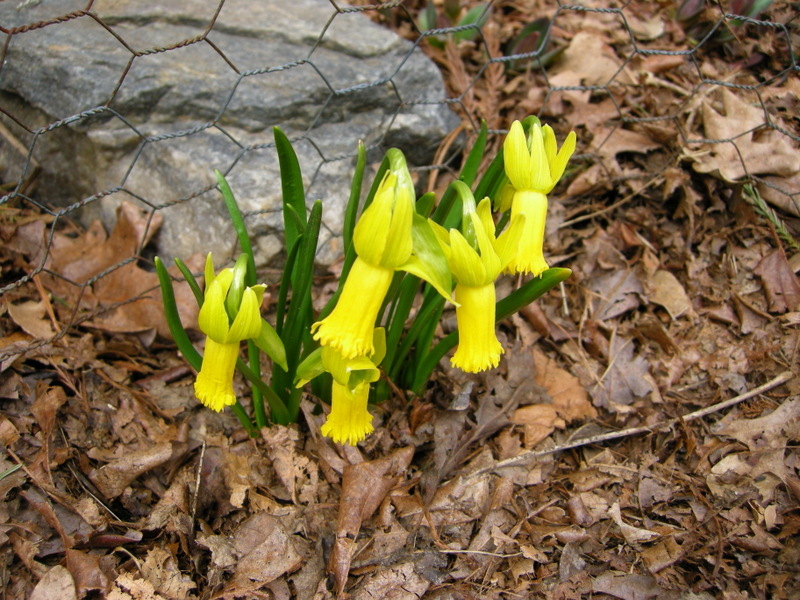 It was discovered by noted bulb expert Gertrude Wister in her garden on the Swarthmore College campus in Pennsylvania, US. A group of ‘Gertrude Wister’. Carolyn’s Shade Gardens is honored to be the only source for this cultivar. A form with 8 petals found in Charles Cresson’s garden. This is the one I want. This lovely flower appeared in the midst of a group of var. wagneri. It has the spots, but then the very pointy tips are dipped in green paint. A similar paint-dipped flower, but this one is outward facing, even more pointy, and has more color. A very large flower with much more prominent spots. A wagneri with more separated petals. A very large flower with alternating spotted petals and pure white petals. Two flowers fused on the same stem: we will have to see if this repeats itself. A true double flower under evaluation by a friend in Belgium. Nursery Happenings: You can sign up to receive catalogues and emails about nursery events or emails about mail order by sending your full name and phone number to carolyn@carolynsshadegardens.com. Subscribing to my blog does not sign you up to receive this information. 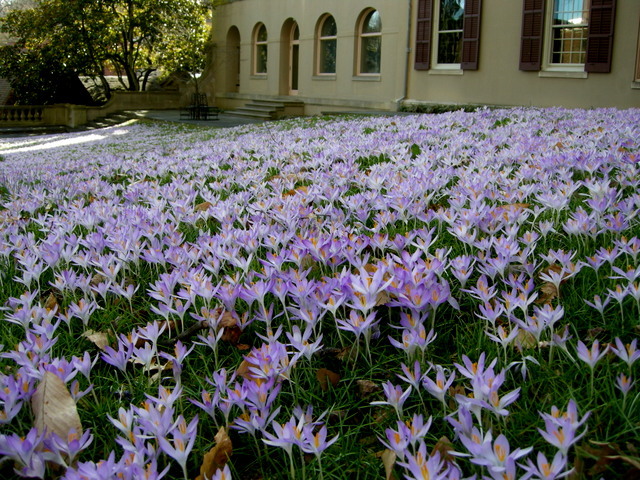 Snow crocus in the courtyard behind the house at Winterthur. 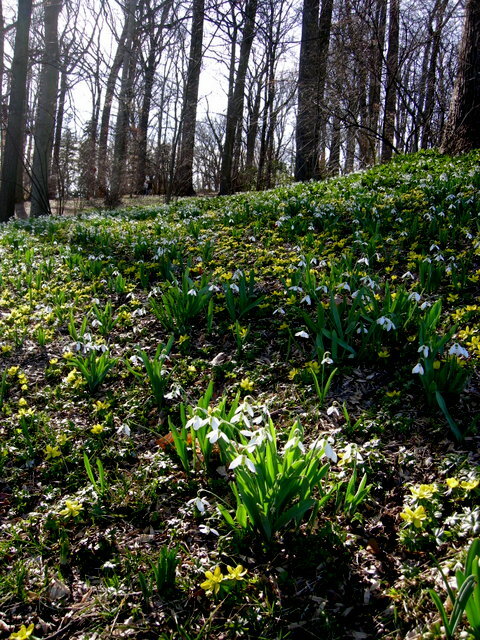 If you are crazy about snowdrops and other winter-blooming plants like snowflakes (leucojum), snow crocus, winter aconite, adonis, and glory-of-the-snow (chionodoxa), then a visit to the March Bank at Winterthur should be on your lifetime bucket list. 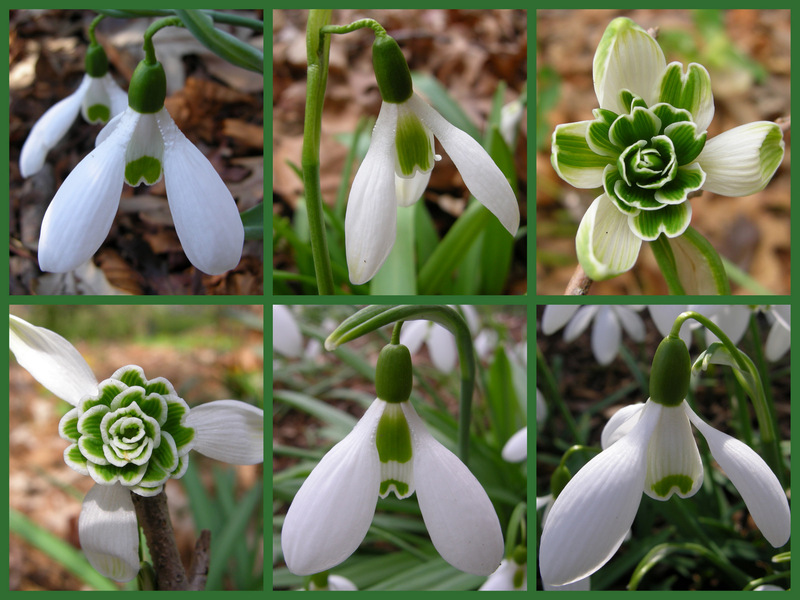 The display is as magnificent as anything found at the great British snowdrop estates. 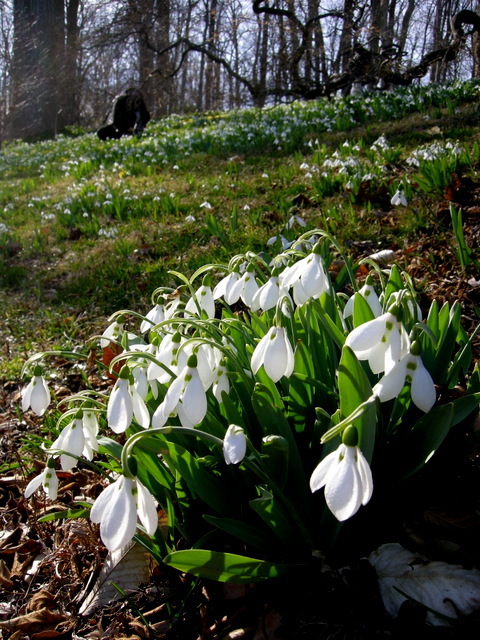 The best time to see it is at the annual Winterthur Bank to Bend Lecture and snowdrop event, being held this year on Saturday, March 12, details below. Some of the hellebores I am bringing to Winterthur, clockwise from upper left: Mango Magic, Apricot Blush, Blue Diamond, Rio Carnival, Sparkling Diamond, Painted, and True Love. Giant snowdrops and winter aconite on the March Bank at Winterthur. 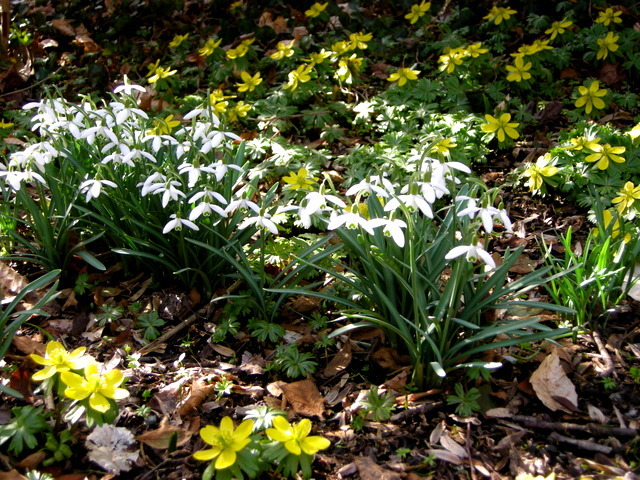 Enjoy the spectacle of the March Bank clothed in snowdrops, winter aconite, adonis, and early snowflake in flower. 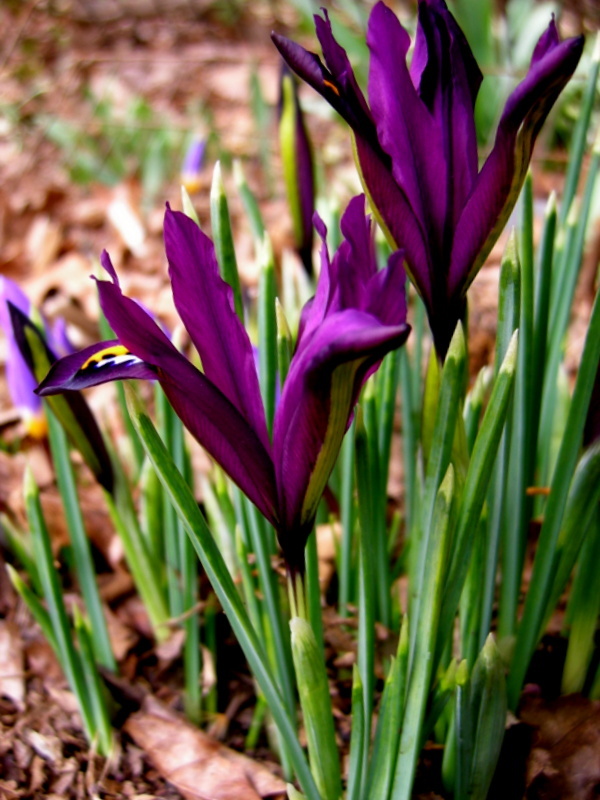 • Sales of rare and unusual plants by Carolyn’s Shade Garden (www.carolynsshadegardens.com), 10:00 am to 3:30 pm. • Guided tours of the March Bank, starting at the Visitor Center at 1:00 pm & 3:00 pm. • A self-guided “White Arrow” tour through the March Bank, starting at the Visitor Center and available all day. 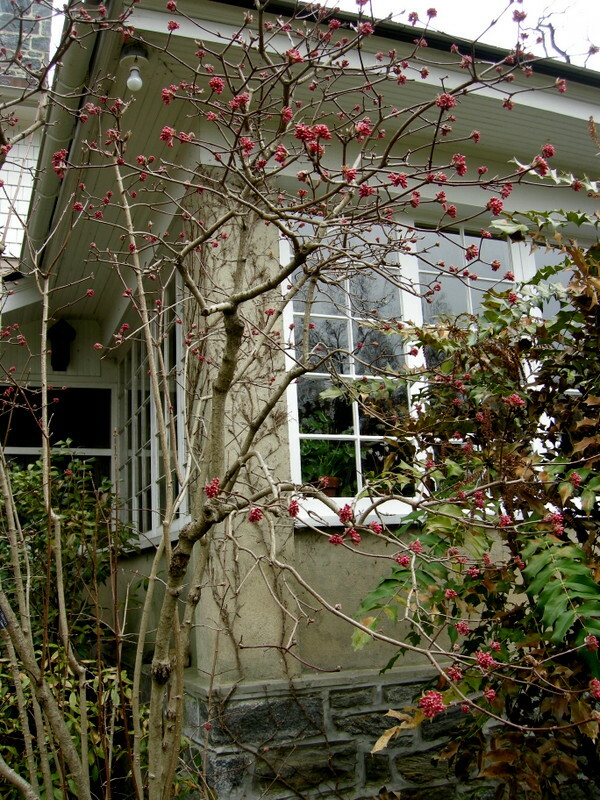 • Special Spring Tour Experience through the House and Conservatory available all day. Lecture: $10 per member. $20 per nonmember. Free for Garden and Landscape Society and Garden Associate Members. All other activities (tours and plant sales) are included with admission. 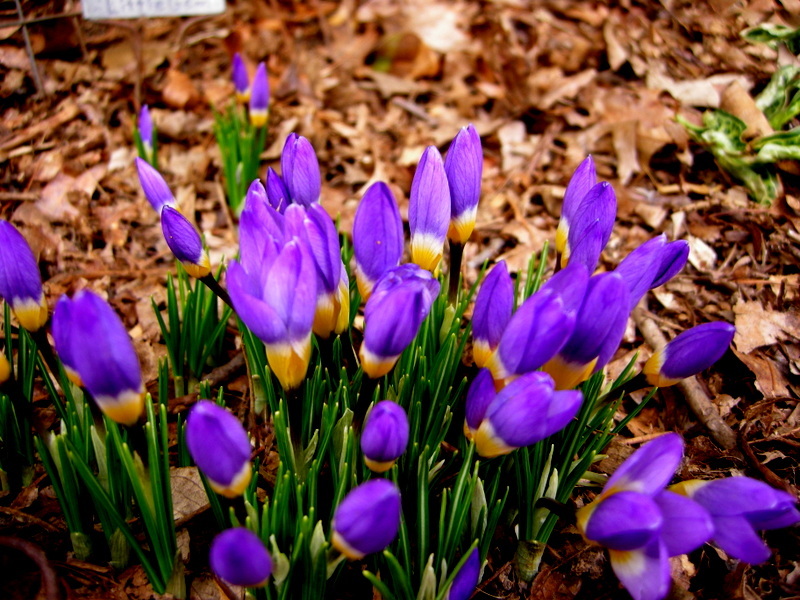 For more information and to register, visit http://www.winterthur.org/spring or call 800.448.3883.. The Winterthur house is considered the premier museum of American decorative arts and is worth a visit in and of itself. Another view of the house. 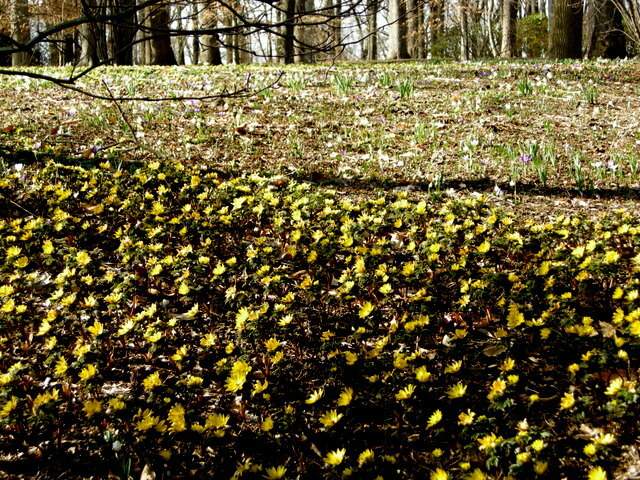 Snowdrops and winter aconite at Winterthur. I hope you can make it on Saturday—it is well worth the trip no matter where you are coming from. 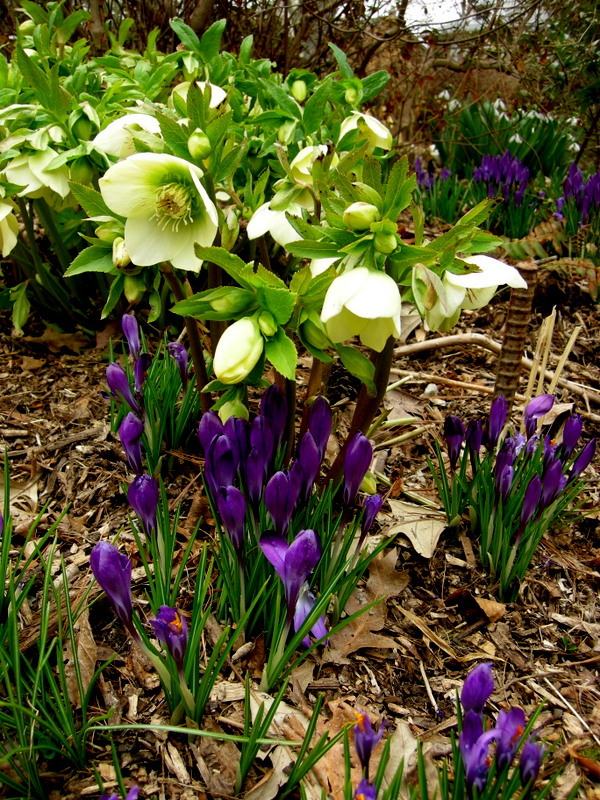 A beautiful winter combination: snow crocus, white hybrid hellebore, and snowdrops in the background. This was one of the few hellebores that were up and open. What a winter! The snow is just melting and the ground is still frozen in places. Today it is 44 degrees and pouring rain. I don’t think the weather that we have had in March has reached the average highs for a normal February. 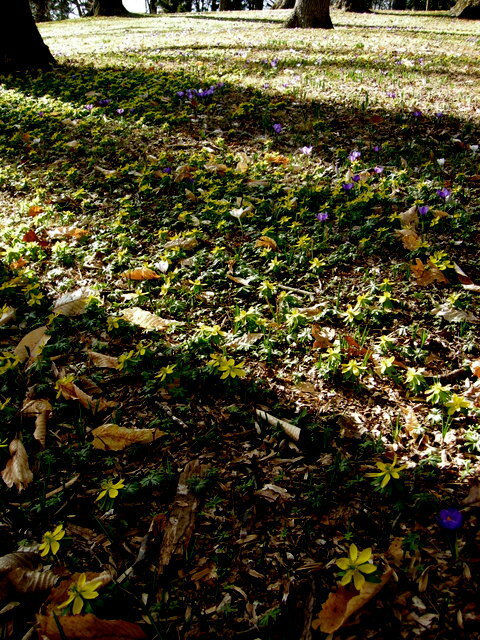 All this has resulted in many problems for Carolyn’s Shade Gardens, and one of them was scheduling Charles Cresson’s 2014 Winter Interest Plant Seminars. 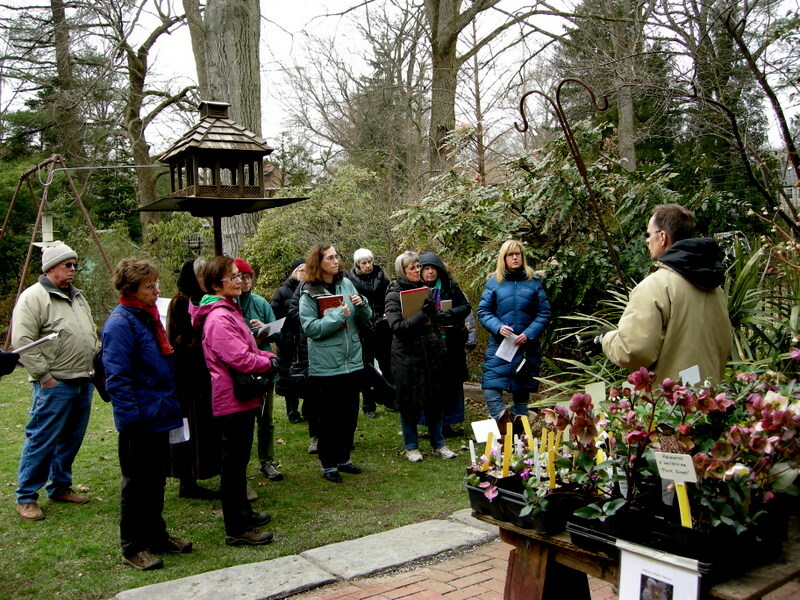 Customers love these seminars during which Charles takes participants around his amazing Swarthmore garden and introduces them to the many plants that thrive in a winter garden. You can see from the preferred attire of seminar attendees that it was quite cold even on the rescheduled date of March 23. 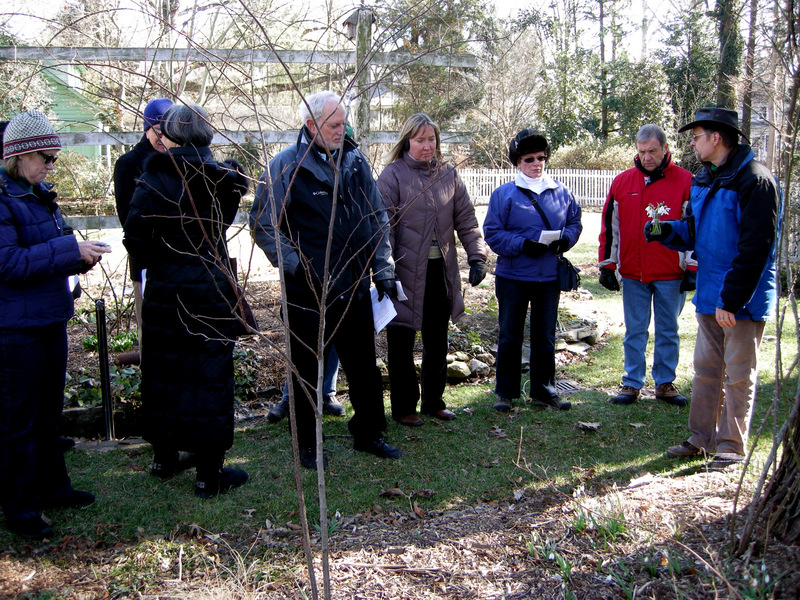 It became clear that we couldn’t hold the seminars on the “normal” dates of the third week in February as Charles’s garden was under several feet of snow. The “rain” dates in the first week of March were equally frozen. We opted for three weeks later, March 23, and 20 of the original 40 participants could actually come that day. Thanks so much to those 20 people who stuck with us through all the rescheduling. 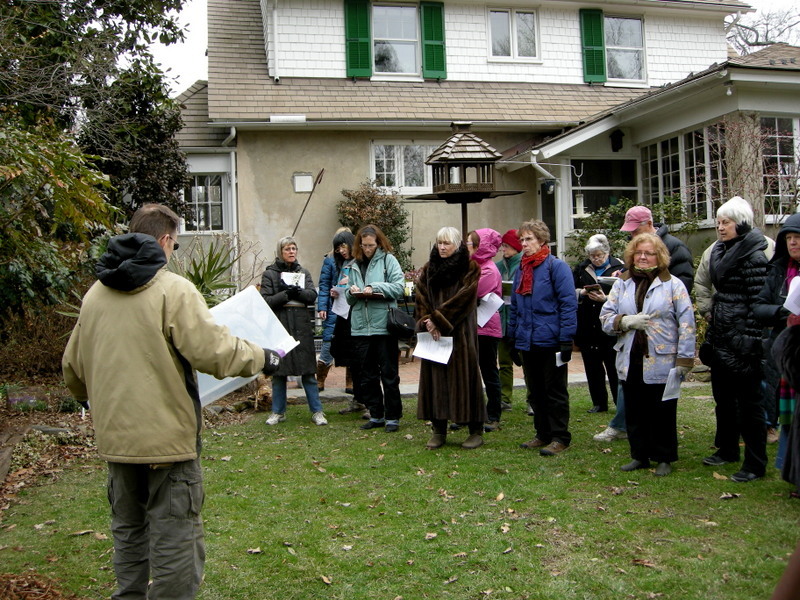 Charles gives the group background on his garden, Hedgleigh Spring. Plants for sale by Carolyn’s Shade Gardens are in the foreground. Although we probably saw less plants than we have in the previous three years, I think the group appreciated them more than ever before. Just the thought that spring might actually be coming was refreshing, and Charles’s enthusiasm for his plants was inspiring. 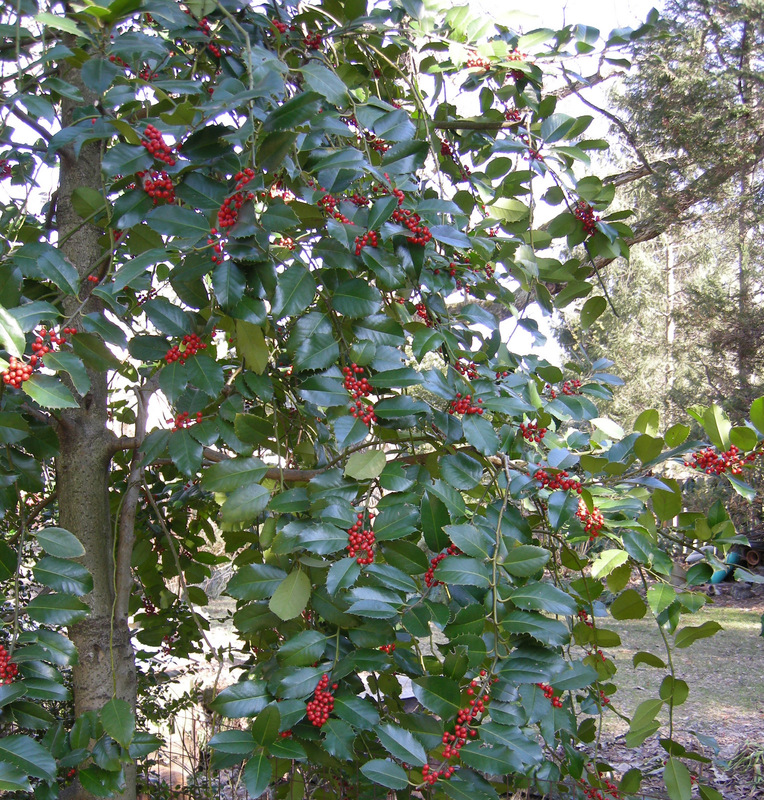 For background on Hedgleigh Spring and Charles Cresson, see Winter Interest Plants 2011. 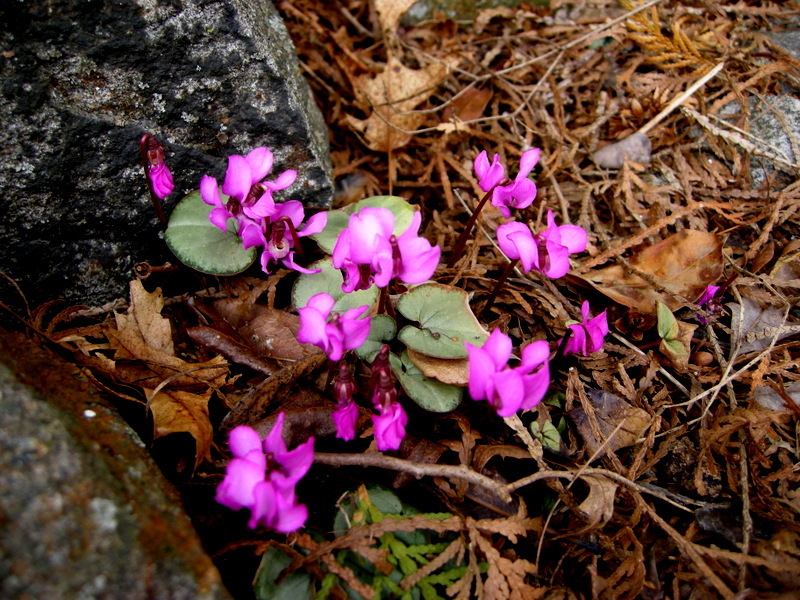 For scenes from previous years, see Winter Interest Plants 2012 and Winter Interest Plants 2013. This technicolor crocus, C. sieberi ‘Tricolor’, caught everyone’s eye. What follows are photos of some of the plants that we saw in the order we visited them. 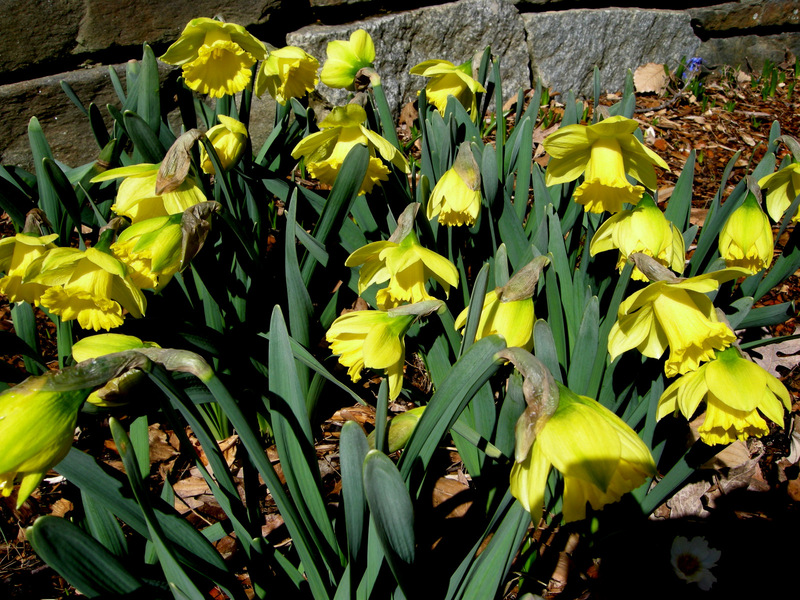 I hope that they will help everyone in the mid-Atlantic think spring. 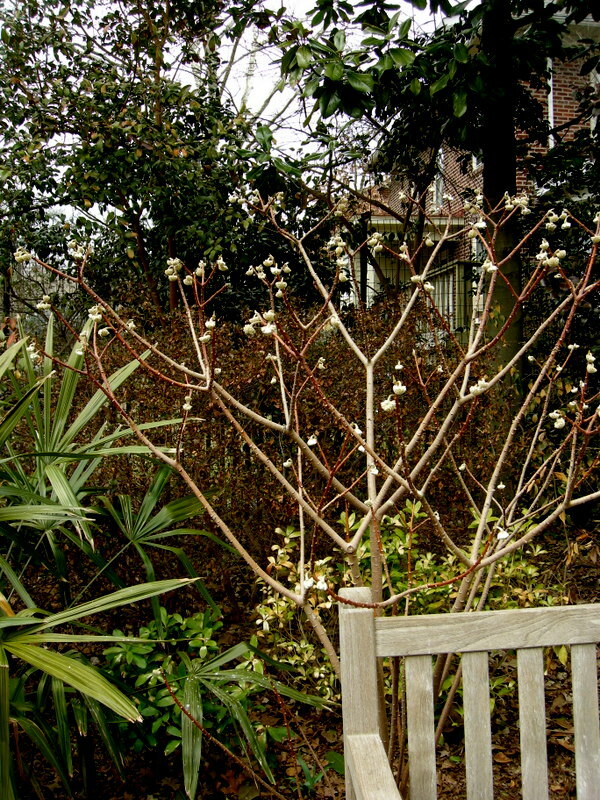 ‘Dawn’ viburnum, V. x bodnantense, is still tightly in bud though usually done blooming by now. 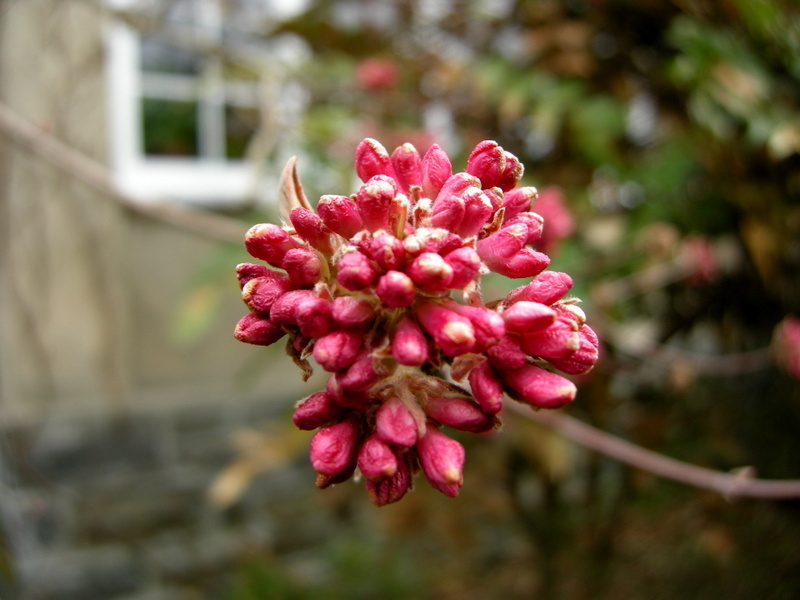 A close up of the rose-colored buds of ‘Dawn’ viburnum—-the flowers are a lighter pink. The old-fashioned snowdrop ‘S. Arnott’ with ‘Rijnveld’s Early Sensation’, a February blooming daffodil. The buds of edgeworthia were not damaged by the cold and are just starting to swell while the hardy palm to the left looks great. 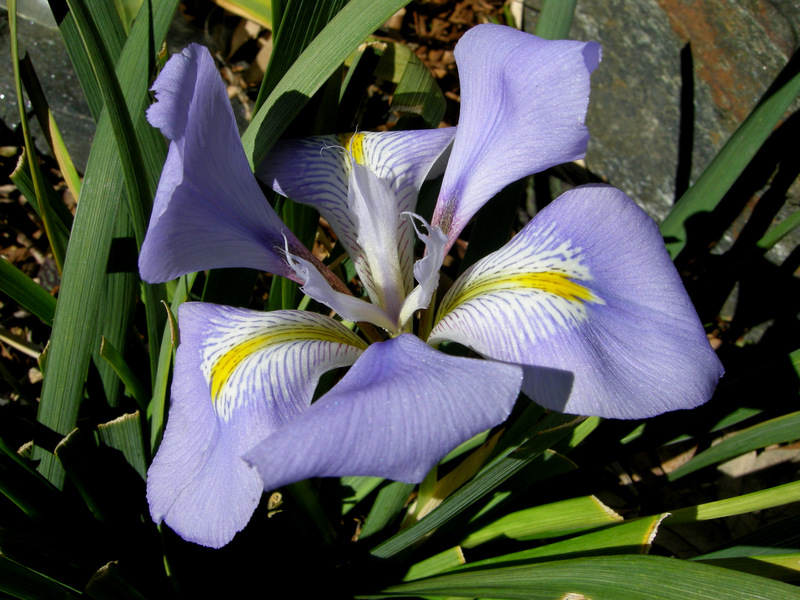 The reticulate iris ‘J.S. Dijt’ was in full bloom while others were still to come. 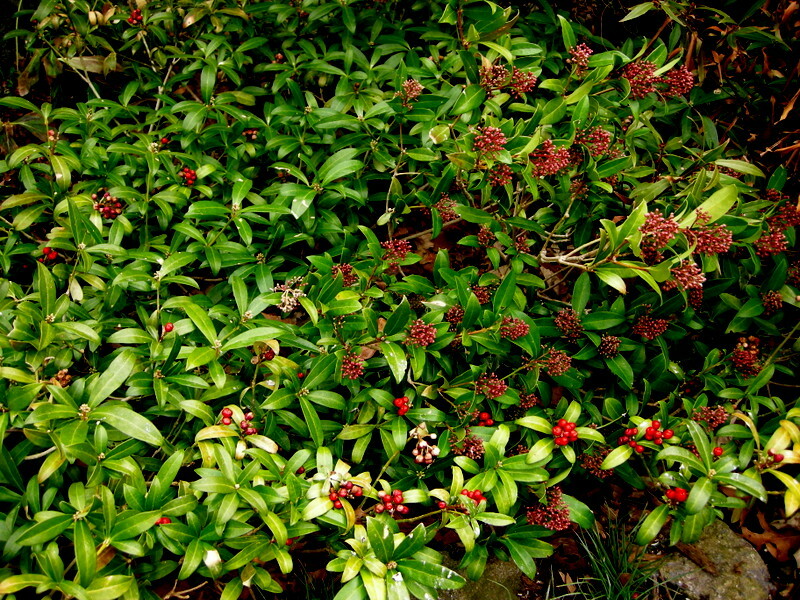 Japanese skimmia was only slightly damaged by our subzero temperatures. 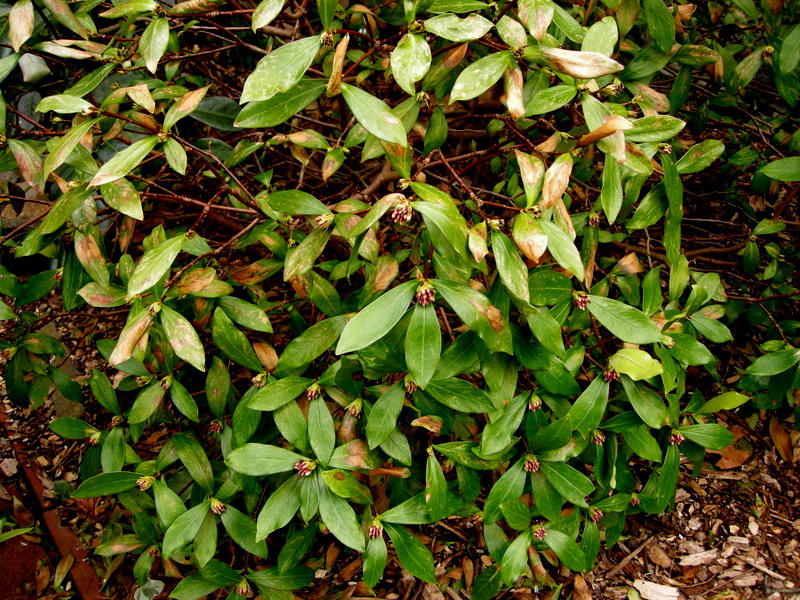 Winter daphne looked a lot worse than the skimmia but will loose the brown leaves and grow fresh green ones before spring is over. The buds are fine and still to open. This tiny early daffodil with recurved petals, the species Narcissus cyclamineus, was much admired. 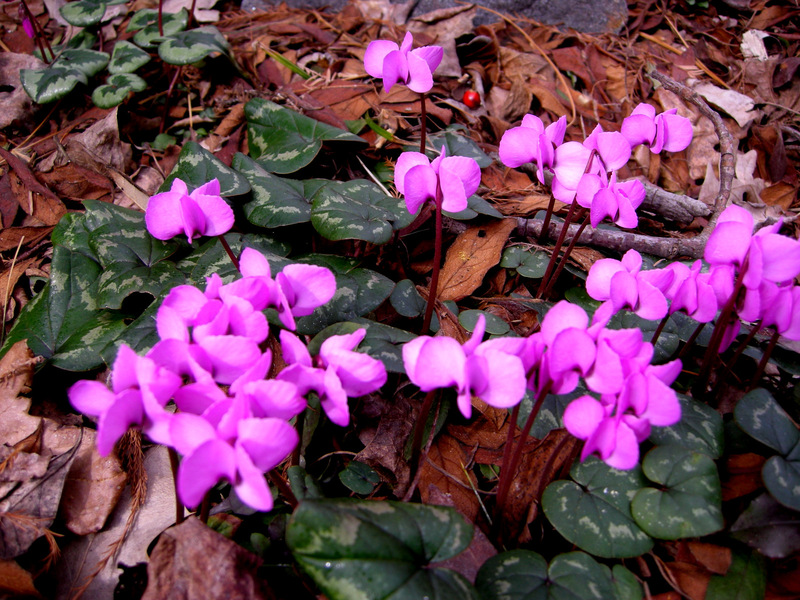 Winter-blooming hardy cyclamen, C. coum, was also beautiful. 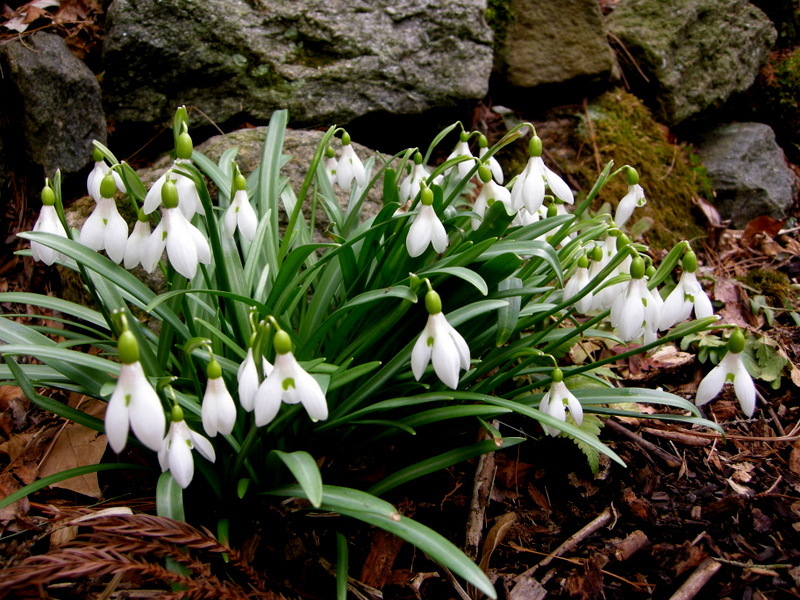 ‘Ballerina’, an elegant double snowdrop—it’s on my wish list. 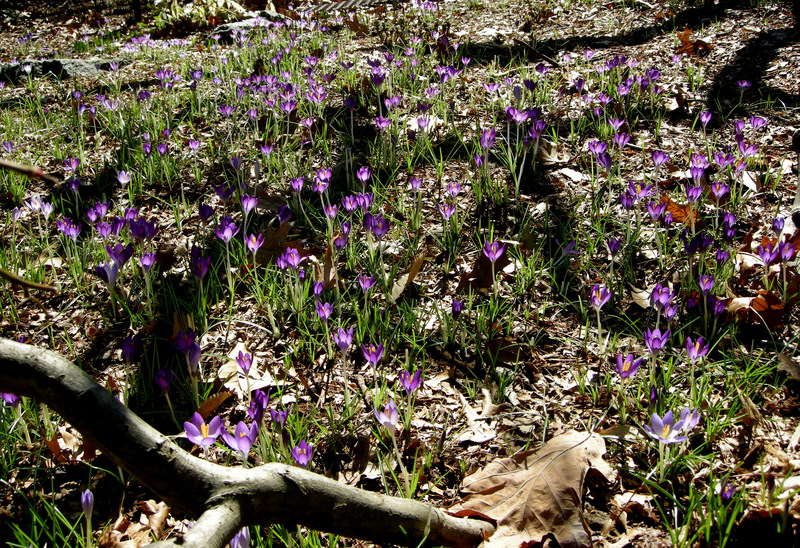 Dutch crocus, C. vernus, pushes through old sterbergia leaves. 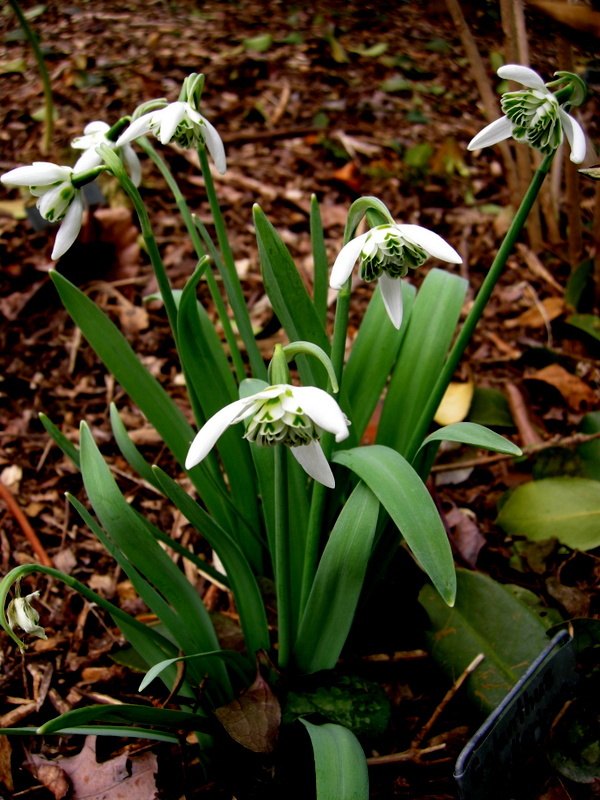 ‘Bill Bishop’ snowdrop with its huge flowers and small stature. 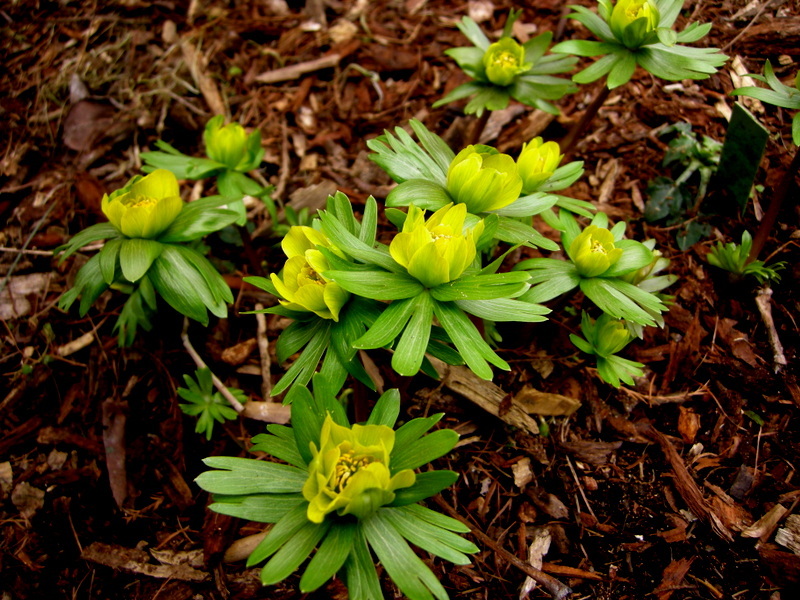 Double winter aconite, Eranthis hyemalis, which Charles grew from seed. A very healthy clump of ‘Magnet’ hybrid snowdrop drooping from the cold. 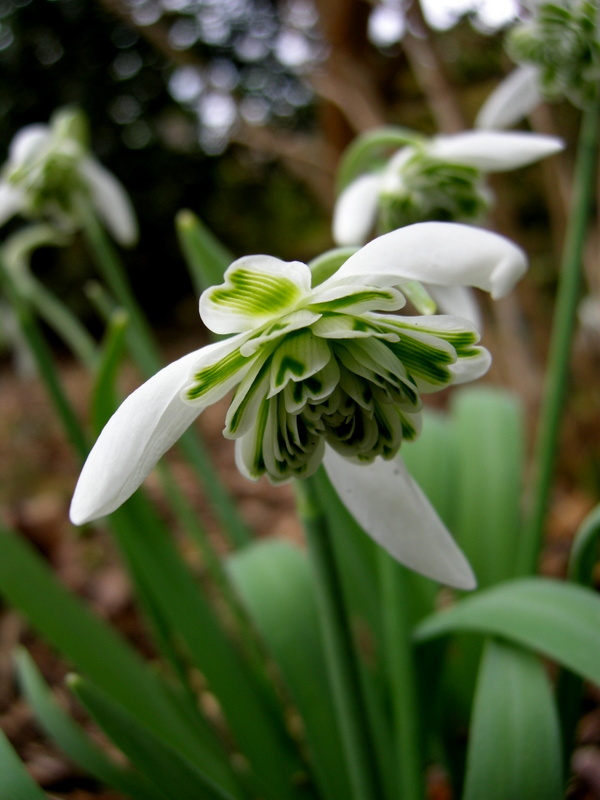 The rare species snowdrop Galanthus rizehensis. 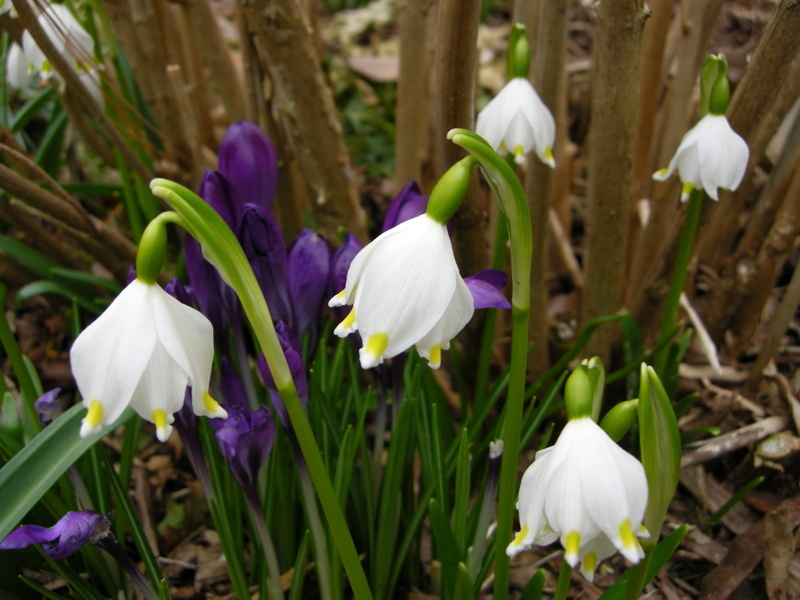 The variety of spring snowflake with yellow markings, Leucojum vernum var. carpathicum. Another group of Leucojum vernum var. carpathicum. 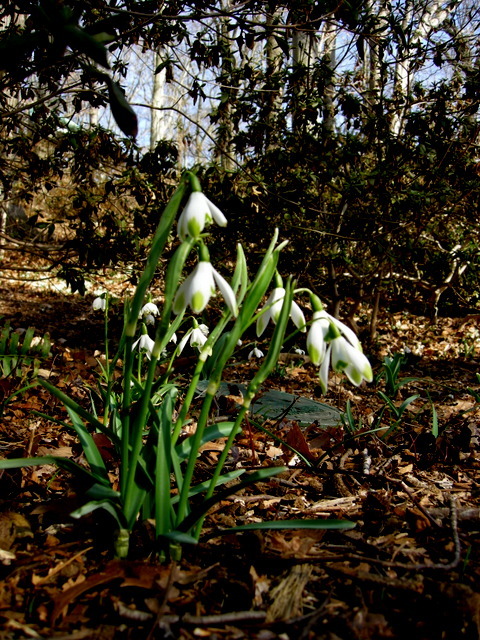 Very rare semi-double spring snowflake ‘Gertrude Wister’, which originated in Swarthmore. Ten happy customers ordered one in my snowdrop catalogue. 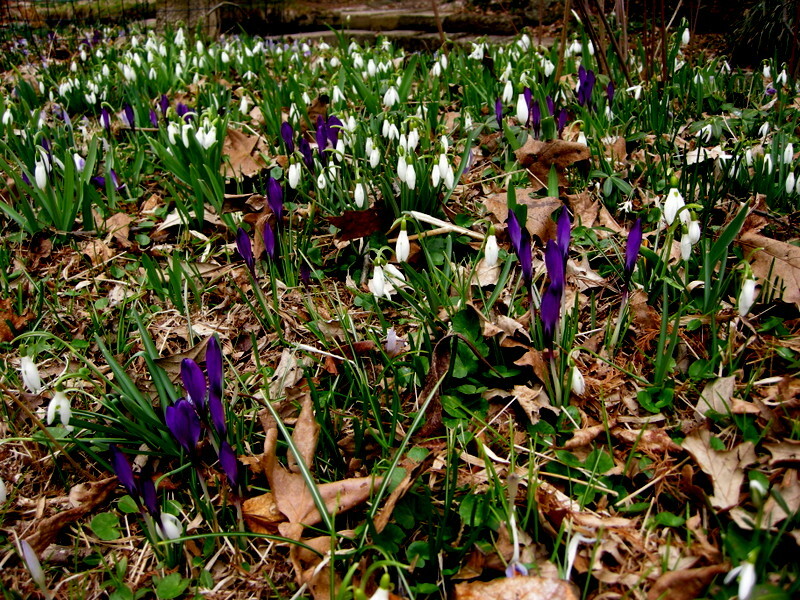 Common snowdrops and snow crocus, the essence of late winter in Charles’s meadow. The only sign of spring in the whole garden, longbract wakerobin, Trillium underwoodii, emerging. The forecast going forward shows no nights below freezing and daytime temperatures in the 50s and even the 60s. Now I just have to get caught up somehow! It has been hard to find time to keep up with the blog and to read other blogs so I apologize to my readers and fellow bloggers. 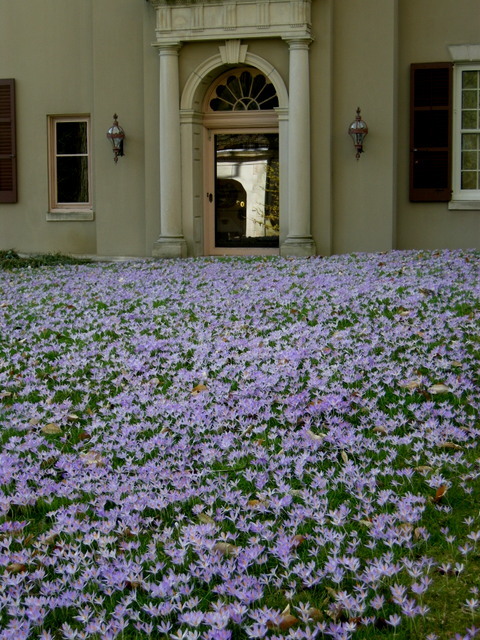 In early March, the courtyard behind the house at Winterthur is completely filled with snow crocus, C. tomasinianus. It is worth visiting in late winter just to see this sight. Each year I choose an outstanding Philadelphia (Pennsylvania, US) area garden to profile through out the seasons. There are so many amazing gardens in the Delaware Valley that I will never run out of choices. It is more a case of which wonderful garden to choose. 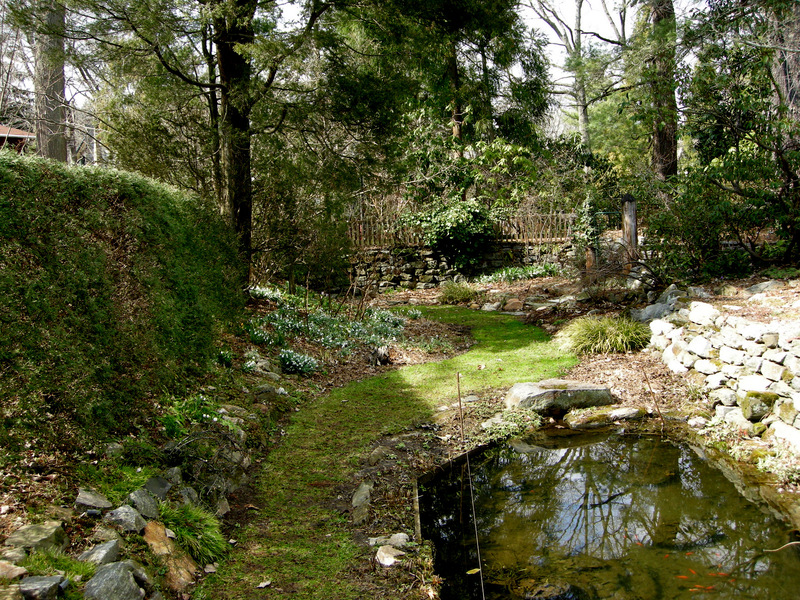 In 2011 to 2012, I visited the enchanting pleasure gardens at Chanticleer. To see those posts, click here. In 2012 to 2013, I focused on the diverse and magnificent gardens and conservatories at Longwood. To see those posts, click here. 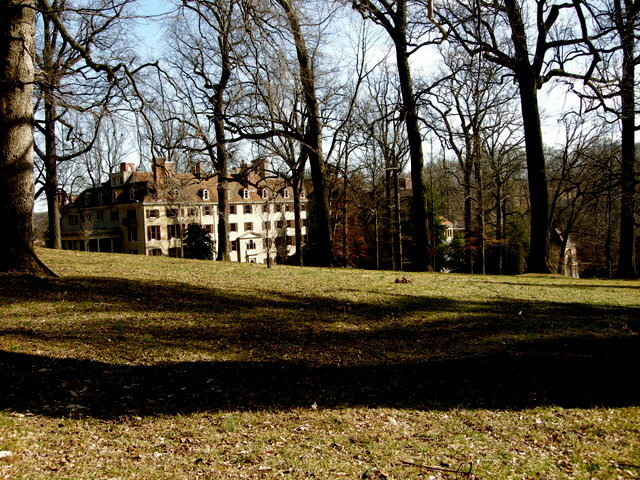 For 2013 to 2014, I have chosen the elegant former estate of collector and horticulturalist Henry Francis du Pont located in Delaware just over the Pennsylvania line and called Winterthur. The Winterthur house holds the premier collection of American decorative art. For scale, look at the two people on the right side of the photo just beyond the path. the Museum will be a continuing source of inspiration and education for all time, and that the gardens and grounds will of themselves be a country place museum where visitors may enjoy as I have, not only the flowers, trees and shrubs, but also the sunlit meadows, shady wood paths, and the peace and great calm of a country place which has been loved and taken care of for three generations. 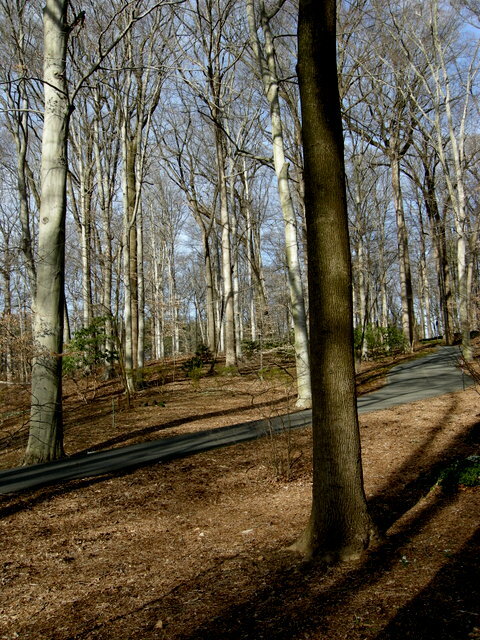 The paths leading from the visitor’s center to the house and gardens meander through the magnificent trees. The “peace and great calm of a country place” is what draws me to Winterthur again and again for the garden is not a botanical collection or a display garden in the usual sense. But rather, as the website states, “an artistic composition that captures a significant period in the history of American horticulture.” It is carefully maintained and preserved to allow visitor’s to enjoy the landscaped gardens as Henry du Pont designed them as well as the peaceful vistas that he carefully incorporated into his designs. Yet it does so with none of the rigidity and dated feeling of many historic gardens. The experience is as fresh and enjoyable as if du Pont himself were giving you a tour of his own backyard, albeit a very large one! Another view of the house in winter. This post shows photos from my visit to Winterthur for their annual snowdrop event, this year on March 9 (for more information on that event, click here). I apologize for the delay, but I have been so busy with my nursery that I just found time to sort through these images. 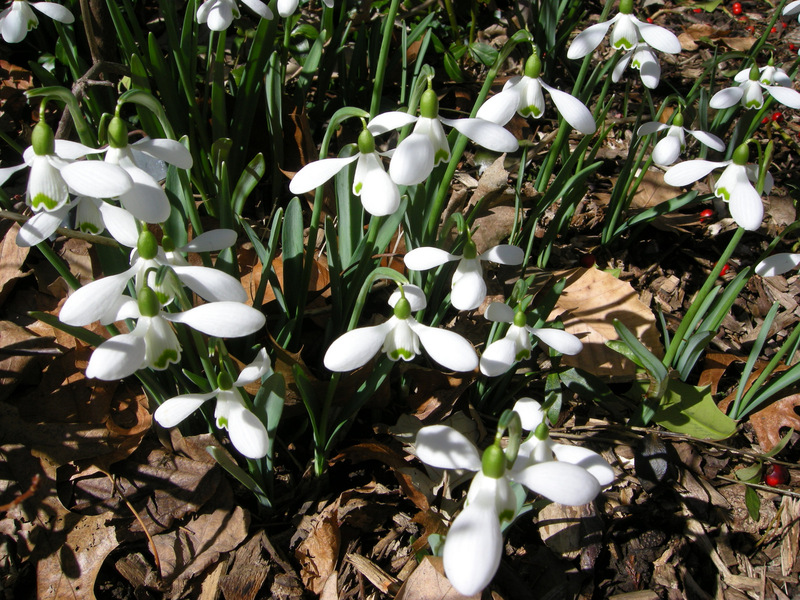 I also thought that pictures of snowdrops and other winter bulbs might really stand out right now when other blogs aren’t posting them anymore. 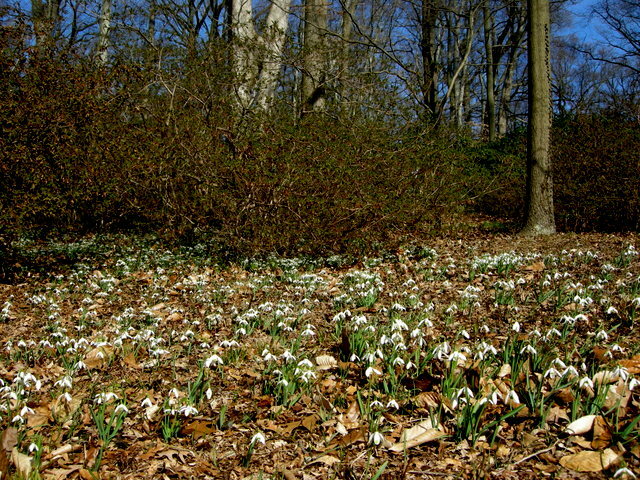 Most of the plants shown are in the area of the March Bank at Winterthur, which contains the premier collection of naturalized snowdrops and other winter interest bulbs in the U.S. 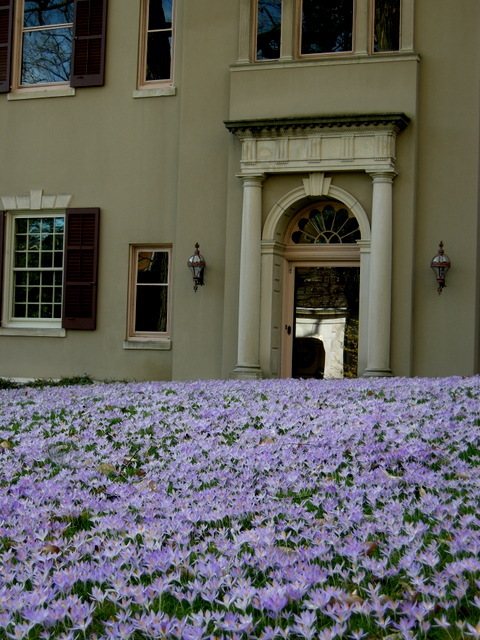 It is very difficult to give readers an idea of the massive amounts of snowdrops, aconite, crocus, glory-of-the-snow, snowflakes, adonis, and other winter bulbs at Winterthur. The plants are so small that once you back up to show a large area, they disappear into the leaf litter (at least using my camera, which is much better for macro shots). You will just have to take my word for it that in person the sweeps of bulbs are breath-taking and unparalleled. Winter aconite with snowdrops in the background. 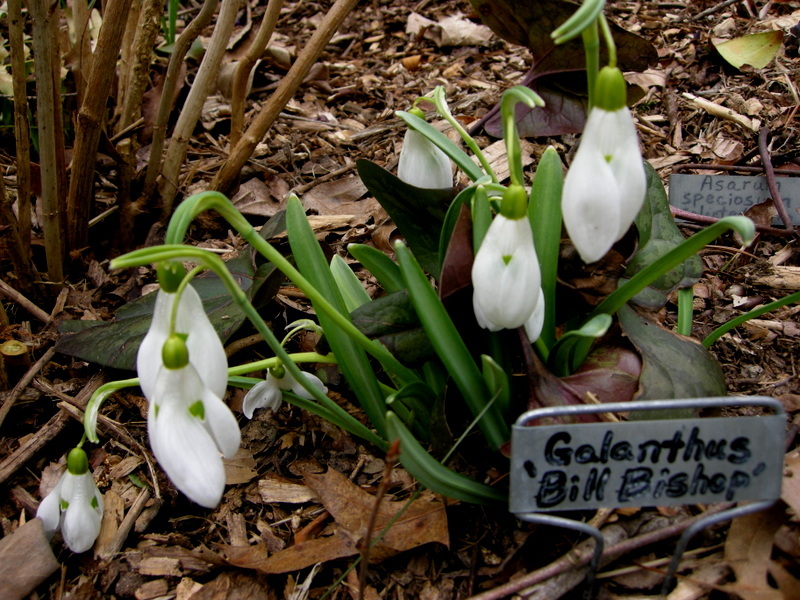 Most of the naturalized snowdrops are the giant snowdrop, G. elwesii. A particularly lovely clump of giant snowdrops with many more (plus a photographer) on the March Bank. Snow crocus growing in the grass courtyard behind the house. 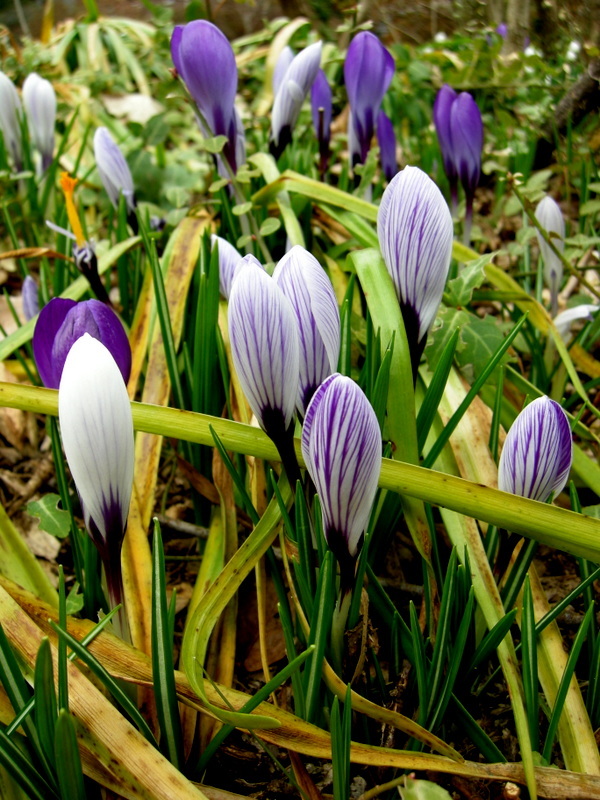 It is much easier to photograph the snow crocus set off by the grass. 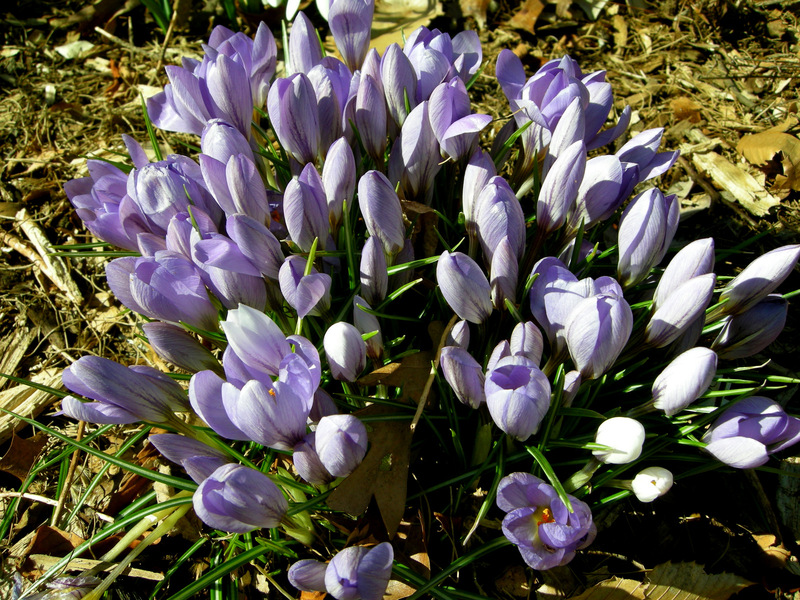 However, all the bulbs in this post appear through out Winterthur in the same massive quantities and are just as awe-inspiring as the crocus portrayed here. I hope you enjoyed Part 1 of my year of Winterthur posts, out-of-season though it may be. If you are local, mark your calendars for March 1, 2014, so you can see this wondrous display for yourself. In the meantime, it is finally summer and my nursery is closed. I will be posting on the blog but less frequently. On Thursday I am off to San Francisco for the 2013 Garden Blogger’s Fling. Enjoy your summer. Carolyn’s Shade Gardens is a retail nursery located in Bryn Mawr, Pennsylvania, U.S., zone 6b. 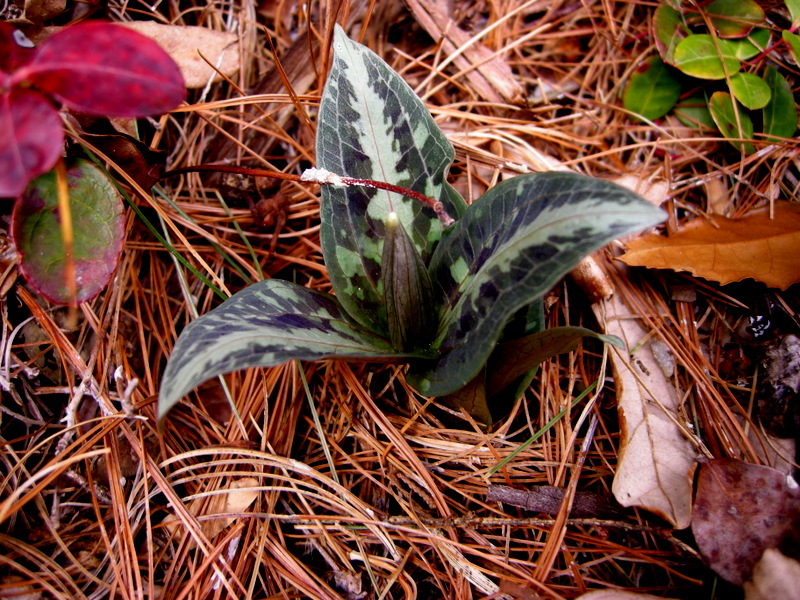 The only plants that we mail order are snowdrops and miniature hostas and only within the US. Nursery Happenings: The nursery is closed and will reopen in the fall around September 15. Have a great summer. 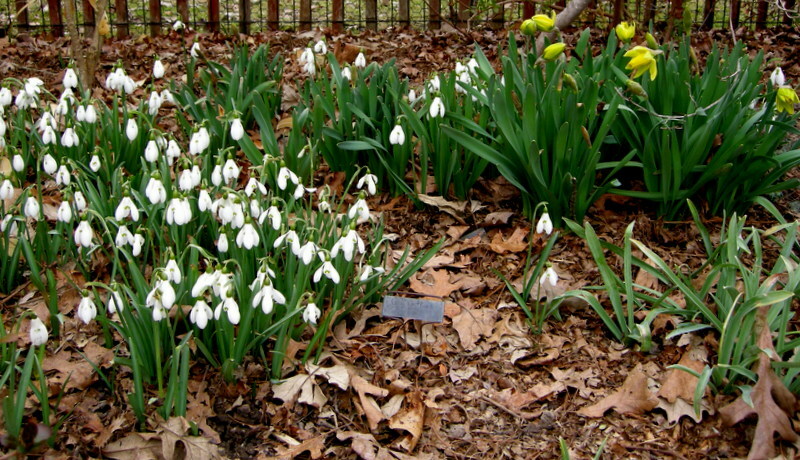 On March 3, 7, and 13, my customers and I attended seminars on Snowdrops and Other Winter Interest Plants given by Charles Cresson at his garden, Hedgleigh Spring in Swarthmore, Pennsylvania (US). Charles is the instructor for the Longwood Gardens certificate course “Hardy Spring and Fall Bulbs” as well as the author of several gardening books. 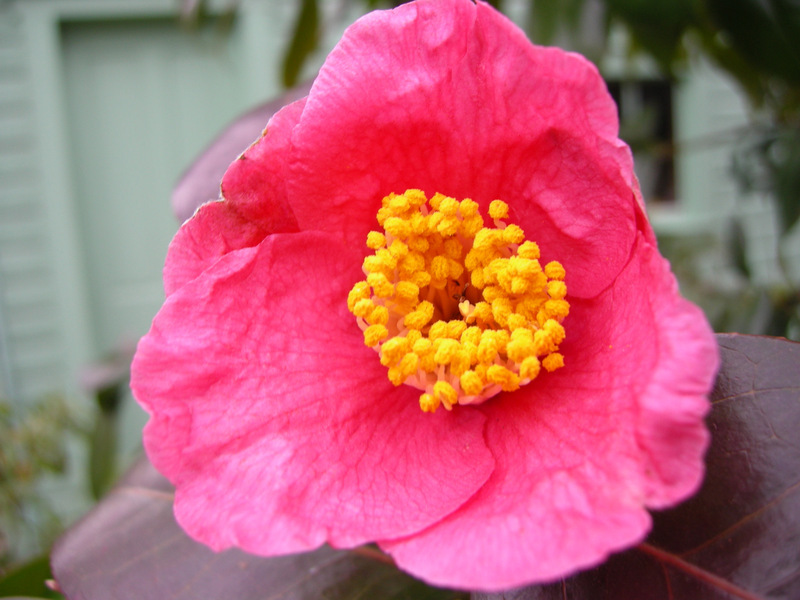 He is also a frequent lecturer, most recently at the Planting Fields Arboretum on Long Island and Rare Find Nursery in New Jersey for presentations on “Choosing Hardy Camellias for Spring and Fall”. 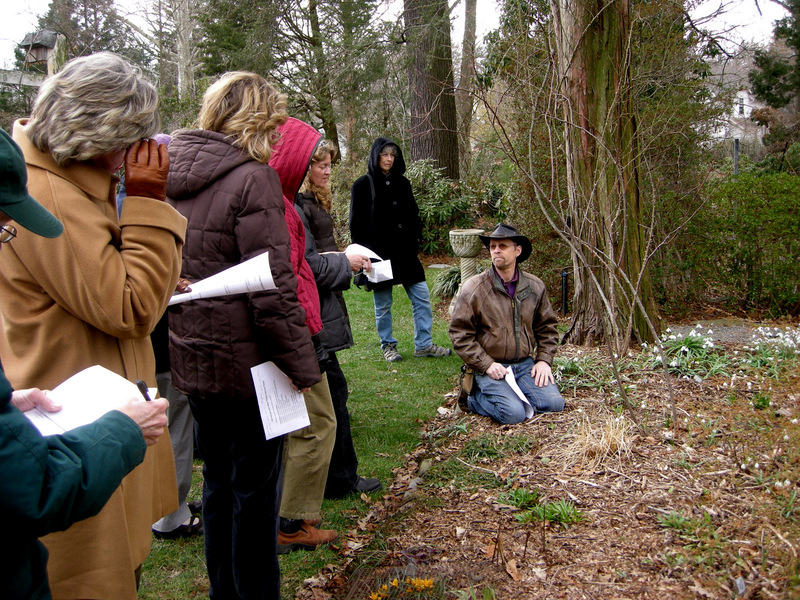 Charles Cresson, kneeling to point out plicate leaves on a snowdrop, to seminar attendees. 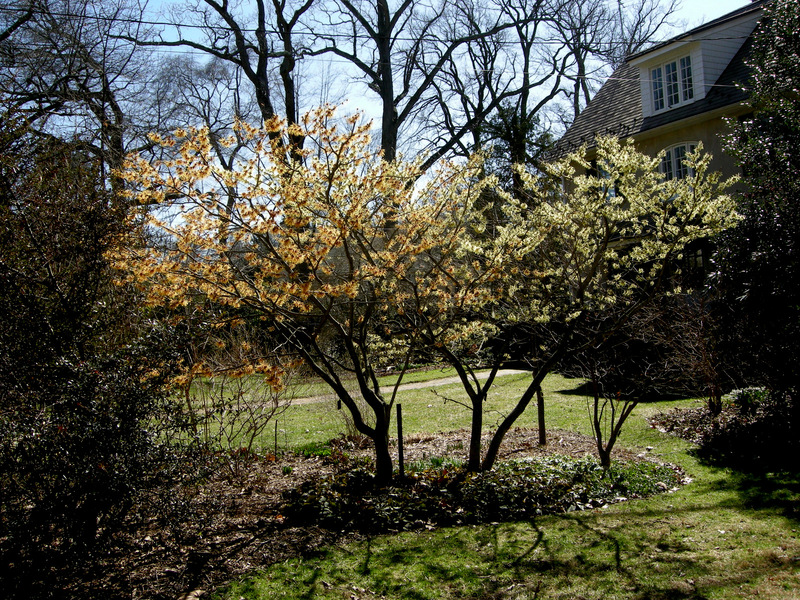 Charles trained at the Royal Horticultural Society, Wisley, in England and the Kalmthout Arboretum in Belgium, best known for its witch hazel introductions. He has worked at Meadowbrook Farm, Winterthur, Nemours, and Chanticleer. His grandfather built the house at Hedgleigh Spring in 1911 and created the garden over the course of 50 years. Charles has gardened there for more than 40 years. 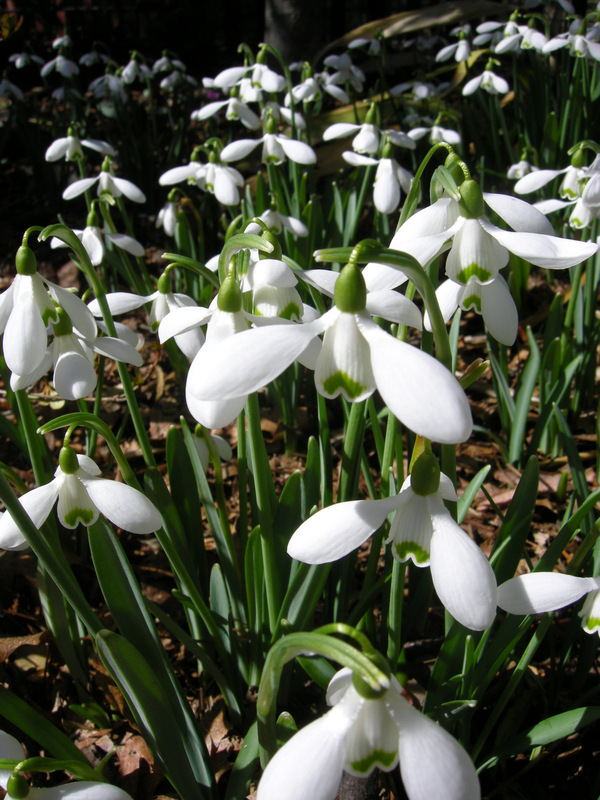 Every time we viewed a new snowdrop, no matter how rare, Charles picked two flowers and passed them around so that we could closely examine the markings and experience the fragrance. He then collected the flowers in a little vase for later comparison. What a treat Charles’s seminars were. Even though I attended all three sessions, I learned something new each time and came away with a deep admiration for Charles’s encyclopedic knowledge of plants and the depth of his plant collection, not to mention a wish list of plants for my own gardens. I also appreciated how each plant was not just deposited in the garden but was carefully incorporated into the overall design. 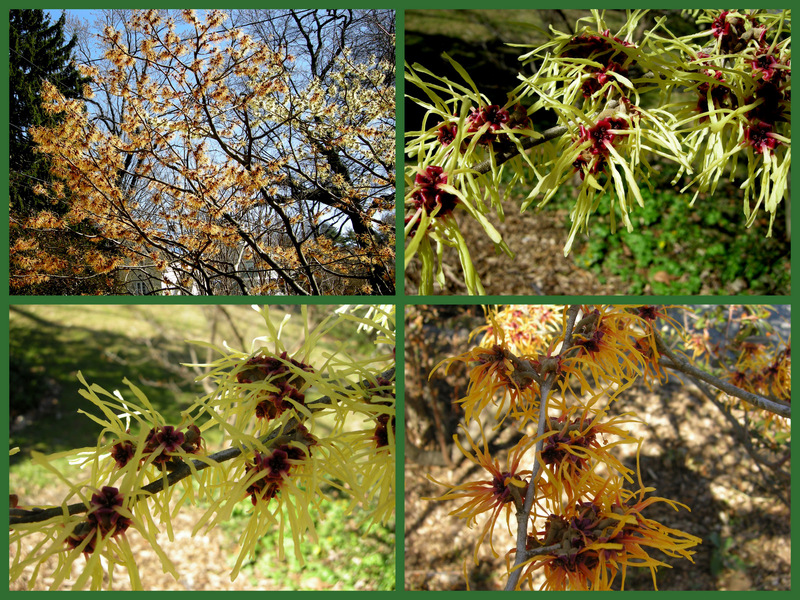 The seminars began in the front garden viewing the hybrid witch hazel cultivars Hamamelis x intermedia ‘Jelena’ (dark orange) and ‘Moonlight’ (pale yellow) underplanted with snowdrops, winter aconite, and various perennials. Charles does not recommend ‘Moonlight’ because it holds its dead leaves. It would be hard to name another garden with the wealth of unusual plants that Charles has found and nurtured to perfection over the years. That being said I thought my customers who were unable to attend the seminars and my worldwide blog readers might like to see what we saw. I have organized the plants by category below with commentary in the caption where relevant. We crossed a stone bridge to view the meadow where snow crocus and common and giant snowdrops were massed to be succeeded by daffodils, camassia, and then summer and fall blooming flowers. 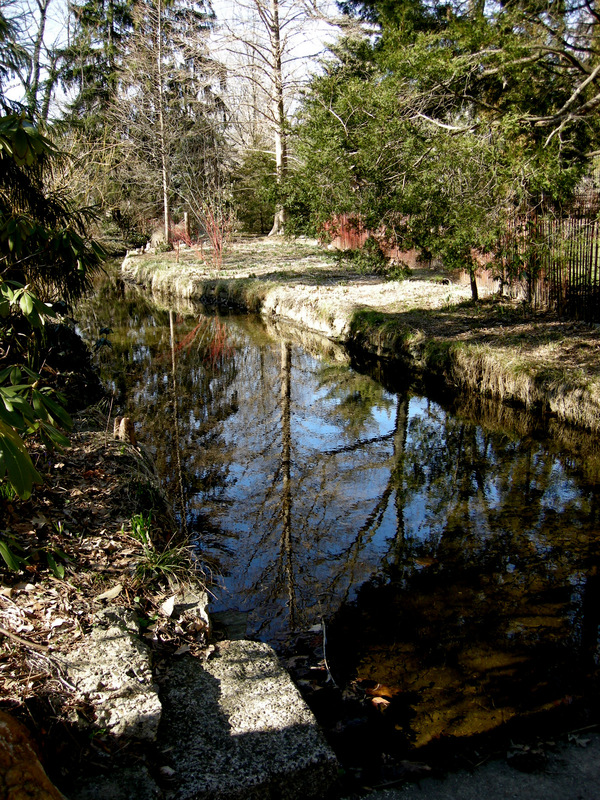 A narrow path skirts the pond, which is surrounded on all sides by rock gardens full of unusual plants. We saw so many rare and unusual bulbs that I can only include a sampling here. Masses of the rodent resistant and very early blooming snow crocus, Crocus tommasinianus ‘Whitewell Purple’, shadowed by a magnificent Japanese maple. 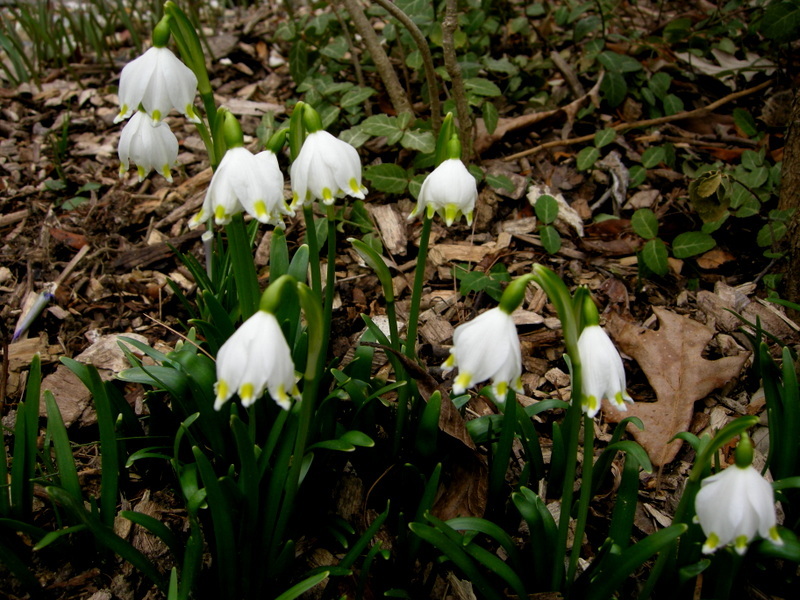 There were large patches of spring snowflake, Leucojum vernum, throughout the garden. 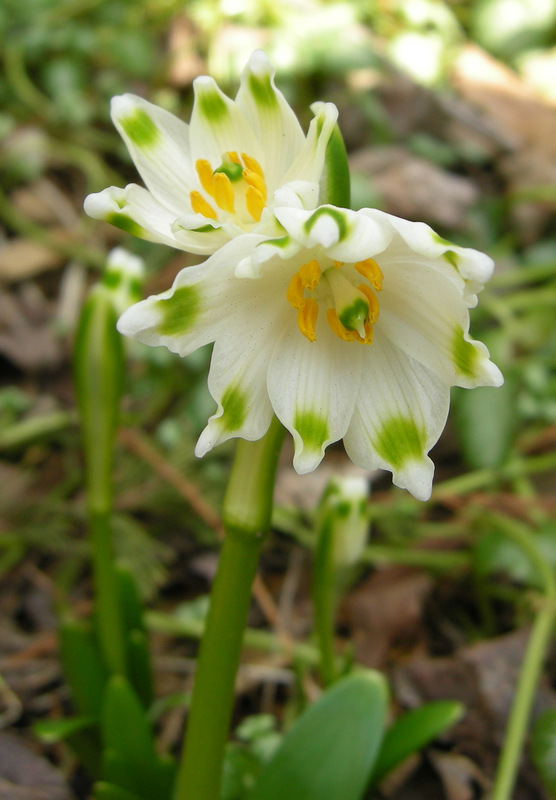 We were privileged to see this semi-double form of spring snowflake, which Charles has named Leucojum vernum ‘Gertrude Wister’ and registered with the Dutch bulb authority. If you read my blog, you know what a galanthophile I am so with supreme effort I have limited myself to just a few of the many snowdrops we saw. 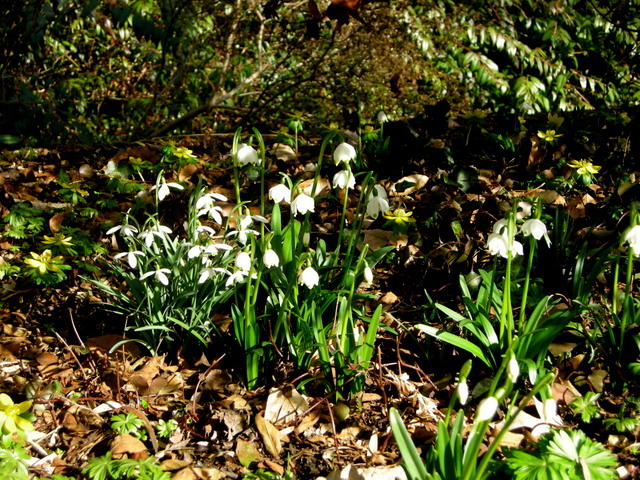 There were drifts of Galanthus ‘S. 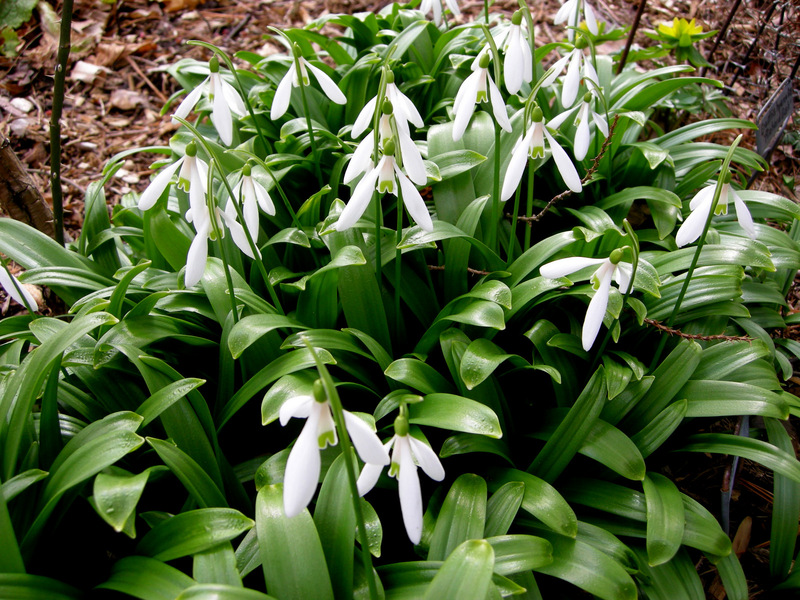 Arnott’, called the ‘desert island snowdrop’ because it is the one cultivar many galanthophiles would choose if they were limited to one. Camellia japonica ‘Spring’s Promise’ was one of several very early spring-blooming camellias that we saw. I hope you have enjoyed your virtual seminar. Please let me know in a comment/reply what your favorite winter interest plant is. Notes: Every word that appears in orange on my blog is a link that you can click for more information. If you want to return to my blog’s homepage to access the sidebar information (catalogues, previous articles, etc. ), just click here. 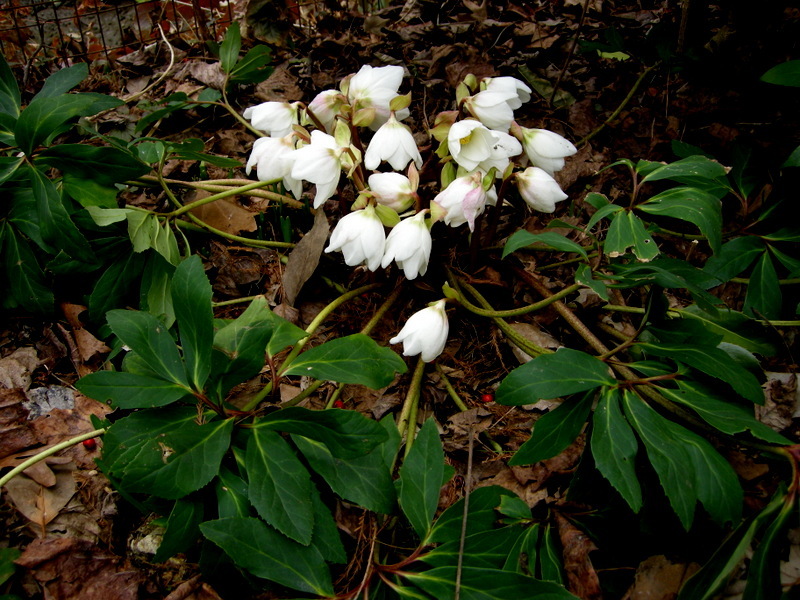 Nursery Happenings: My first open house sale is Saturday, March 26, from 10 am to 3 pm, featuring hellebores and other winter and early spring blooming plants for shade (checks and cash only). For directions and parking information, click here.